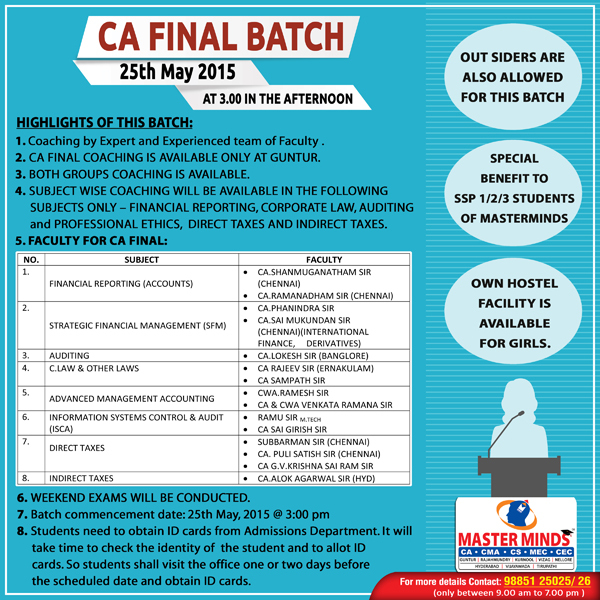 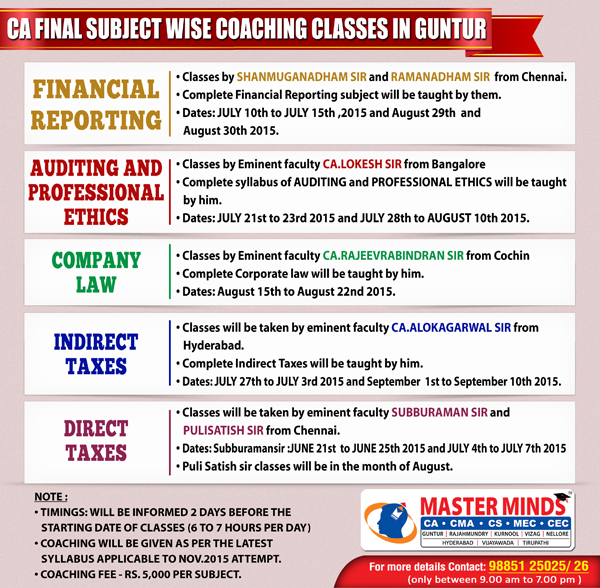 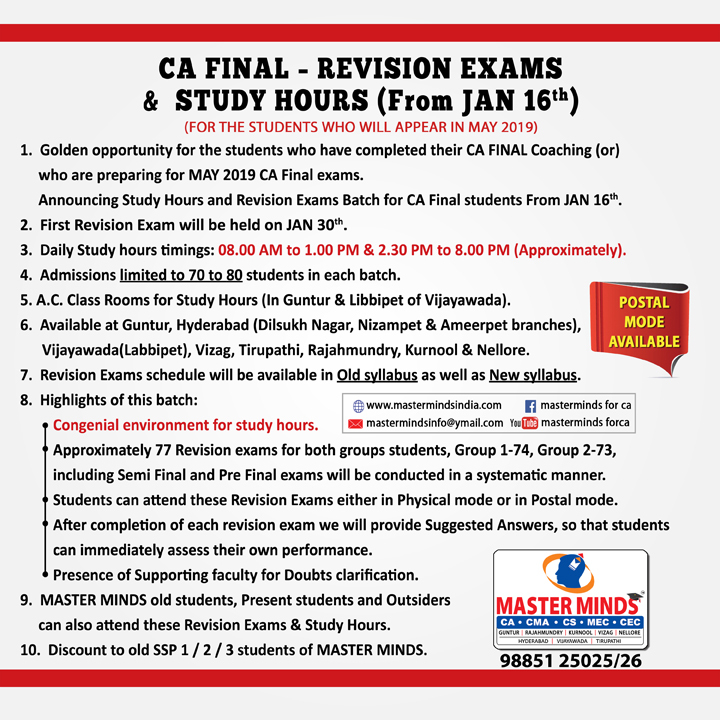 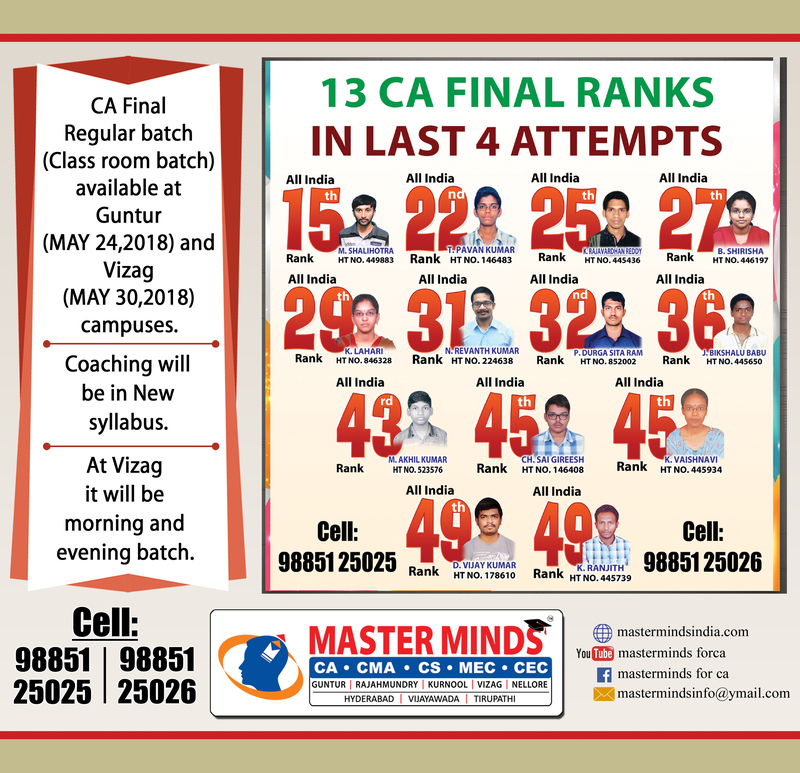 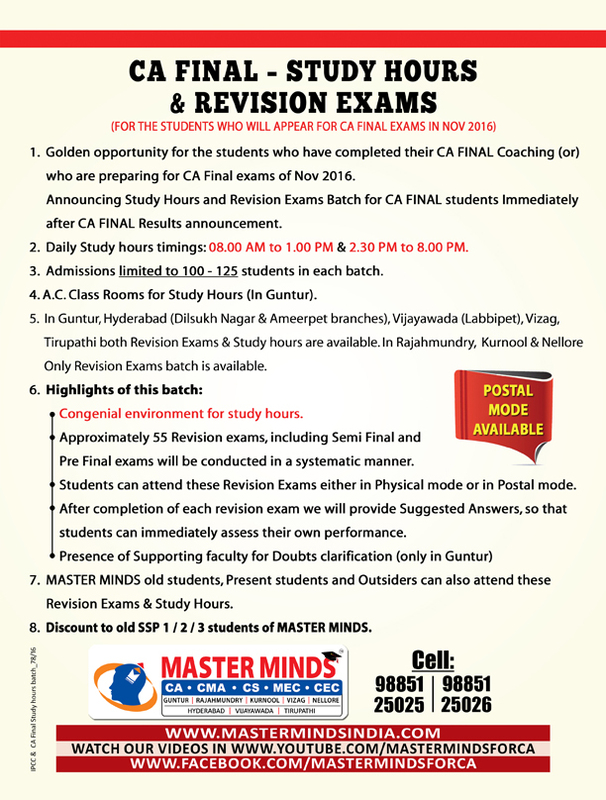 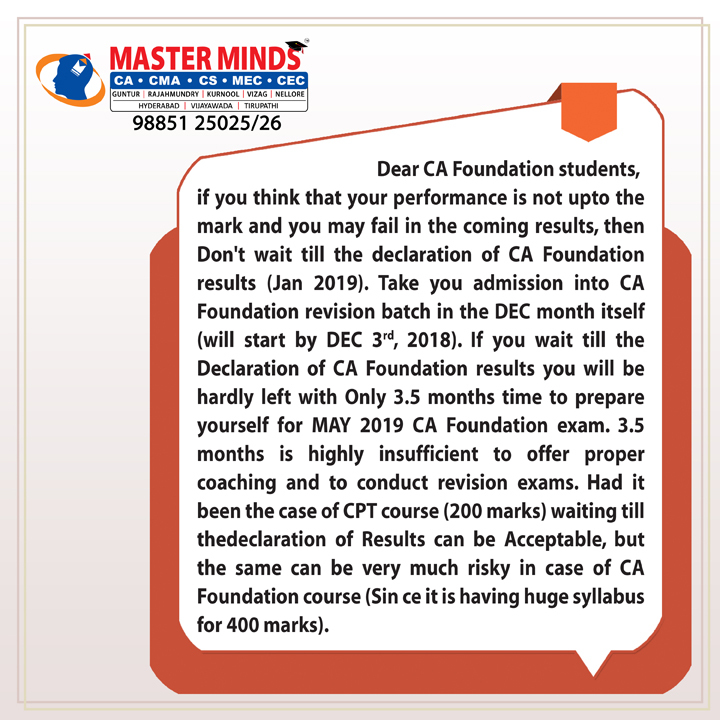 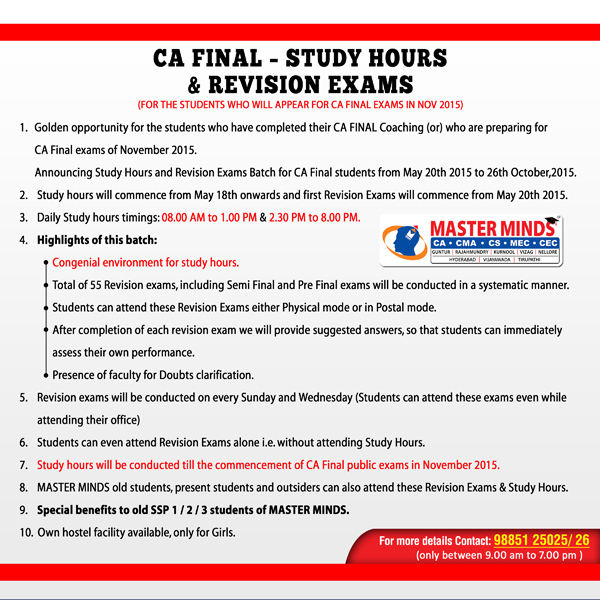 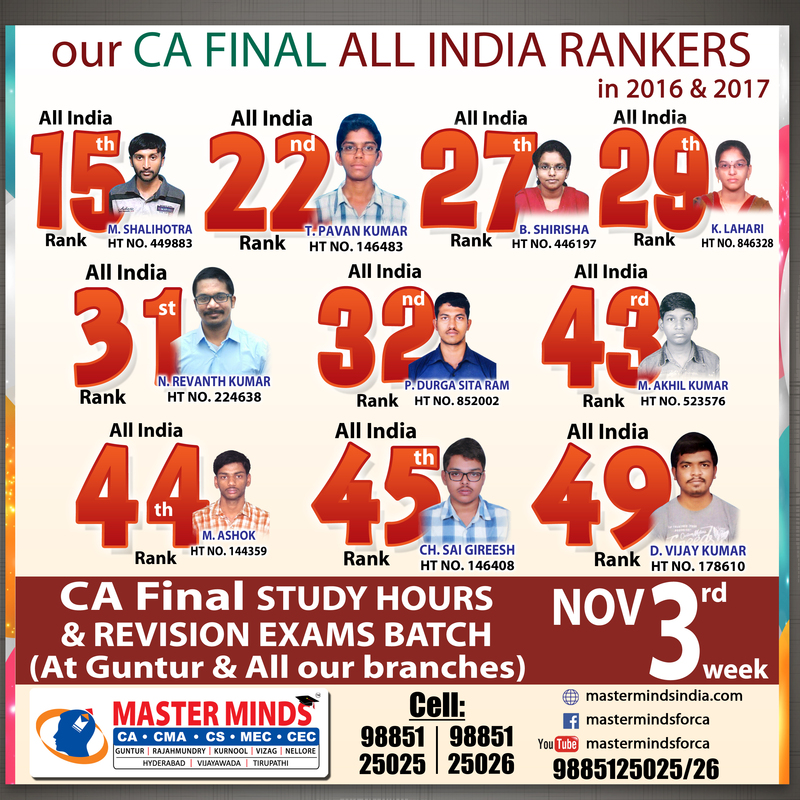 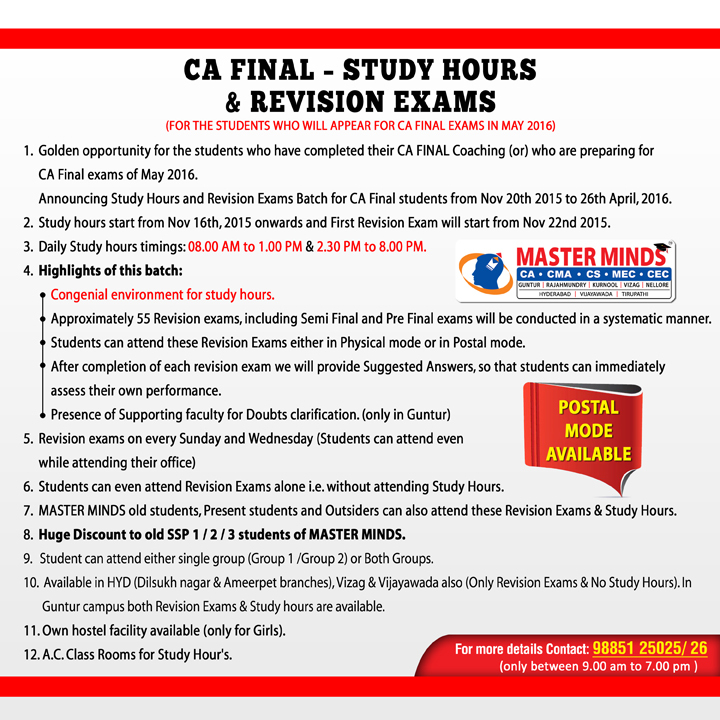 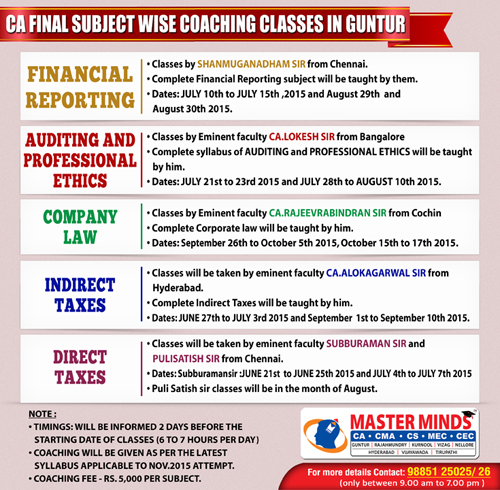 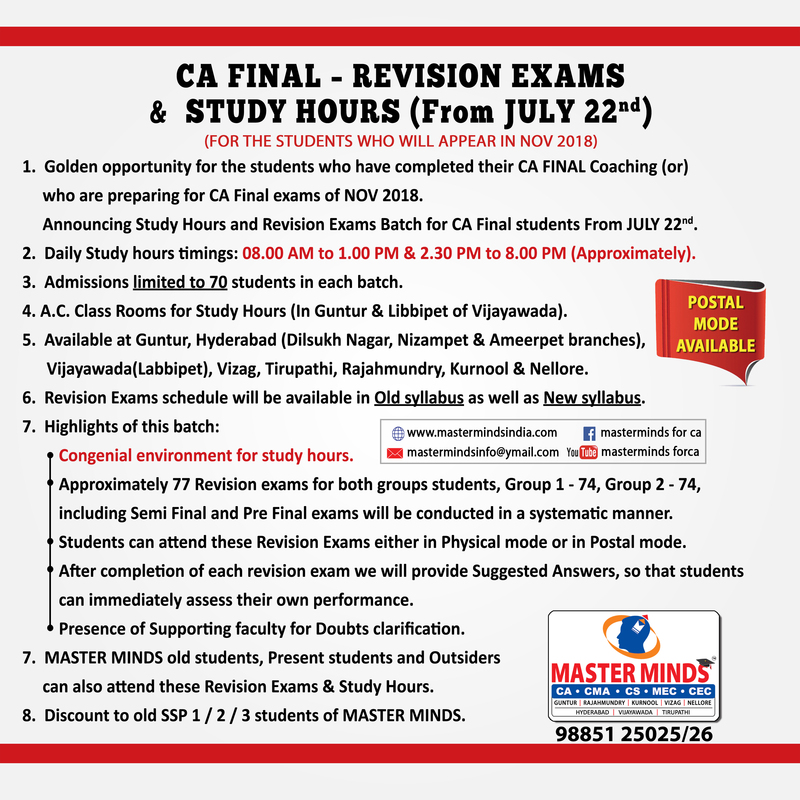 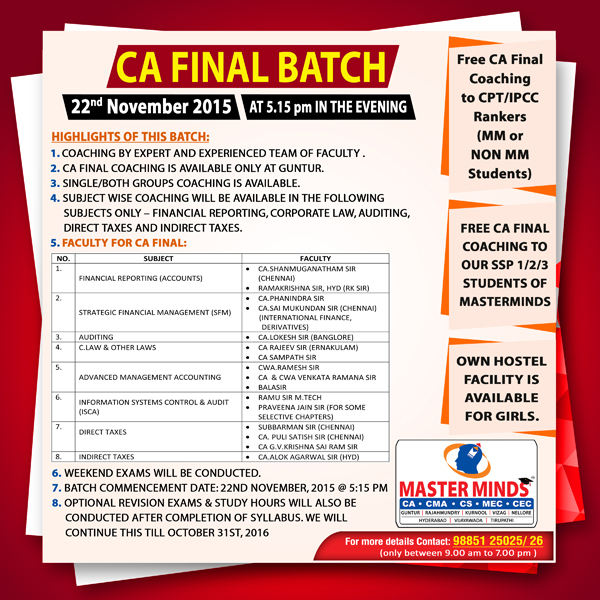 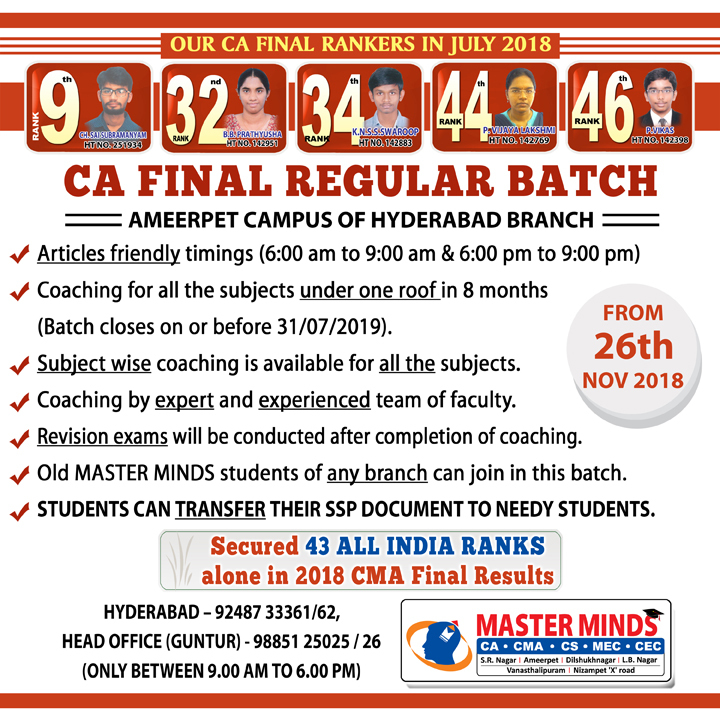 CA Final Subject wise coaching. 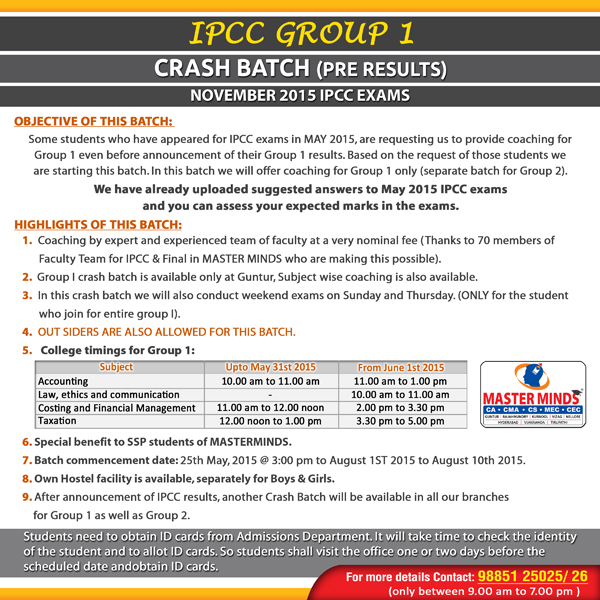 IPCC – Group 1 Crash (pre results). 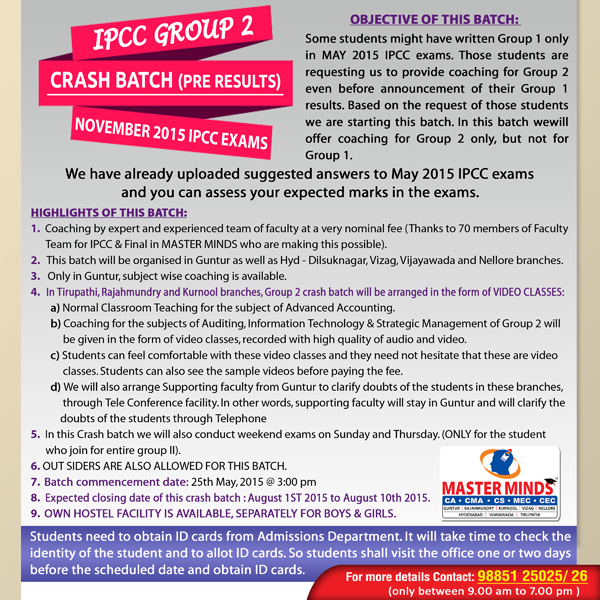 IPCC – Group 2 Crash (pre results). Got All India 1st in ICWA final results declared on May 26. 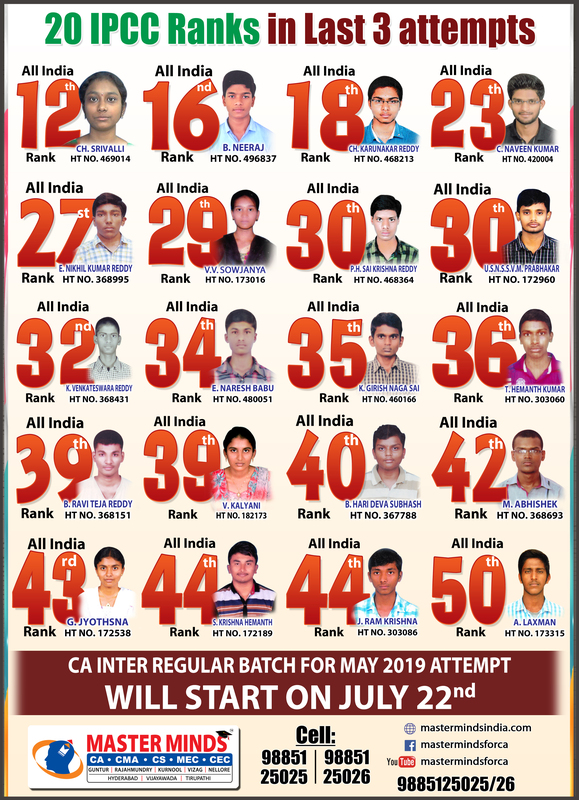 Till now Got 139 All India ranks. 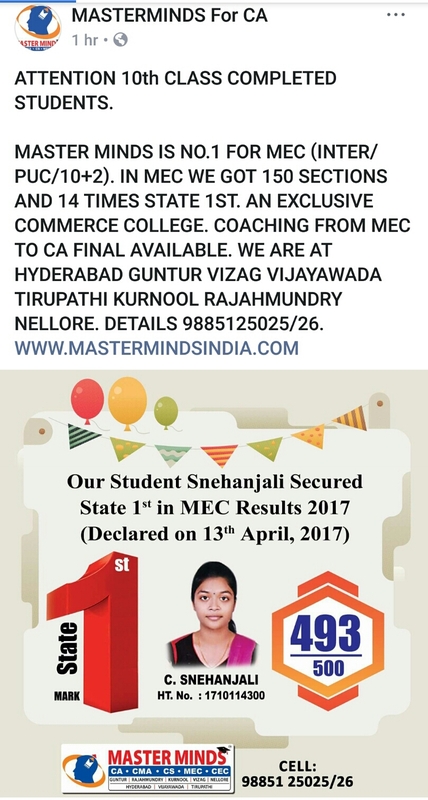 It is a victory first time in our History. 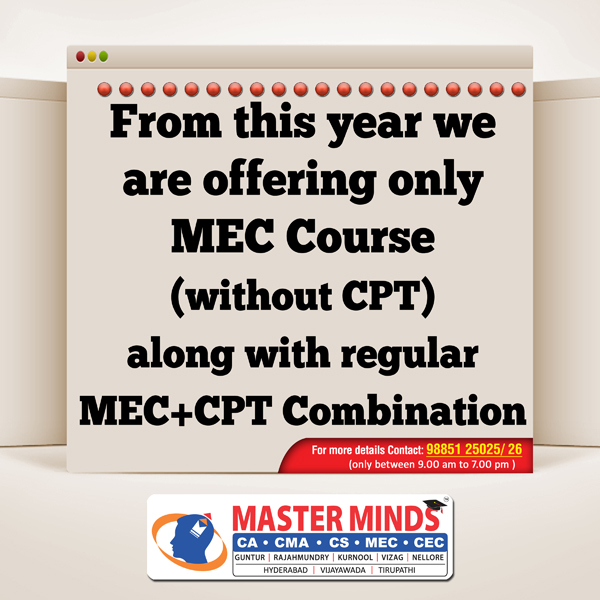 CPT REGISTRATION DATE IS EXTENDED UPTO APRIL 5TH . 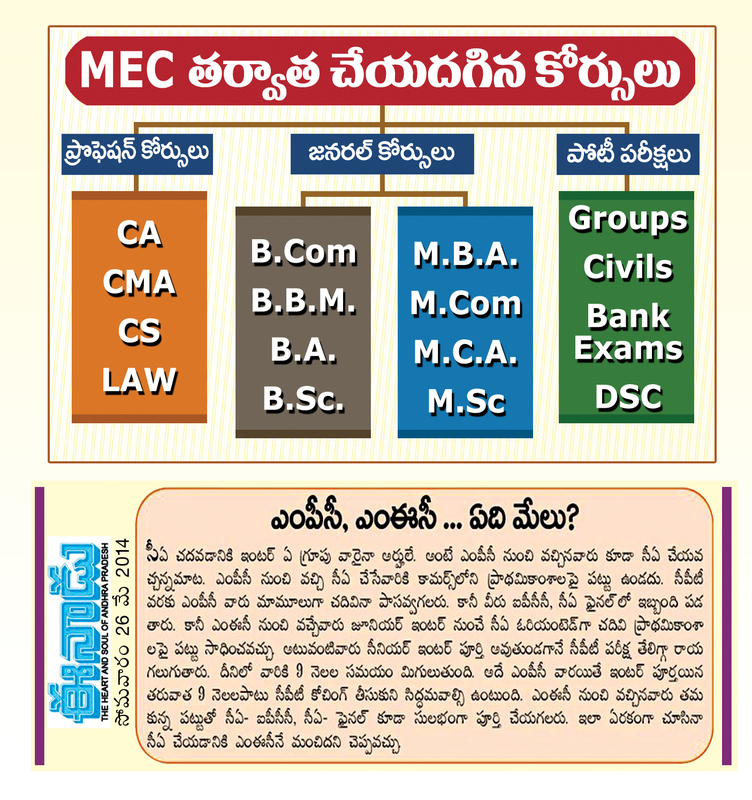 Launching New Branches at Nellore and Vizag Very Soon. 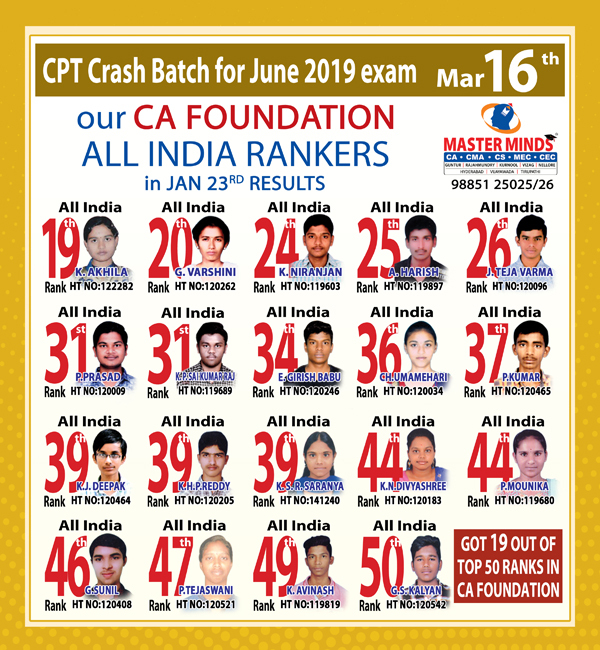 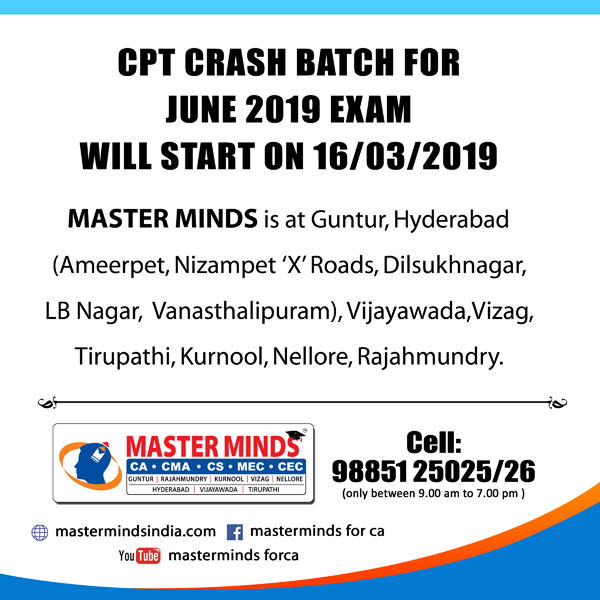 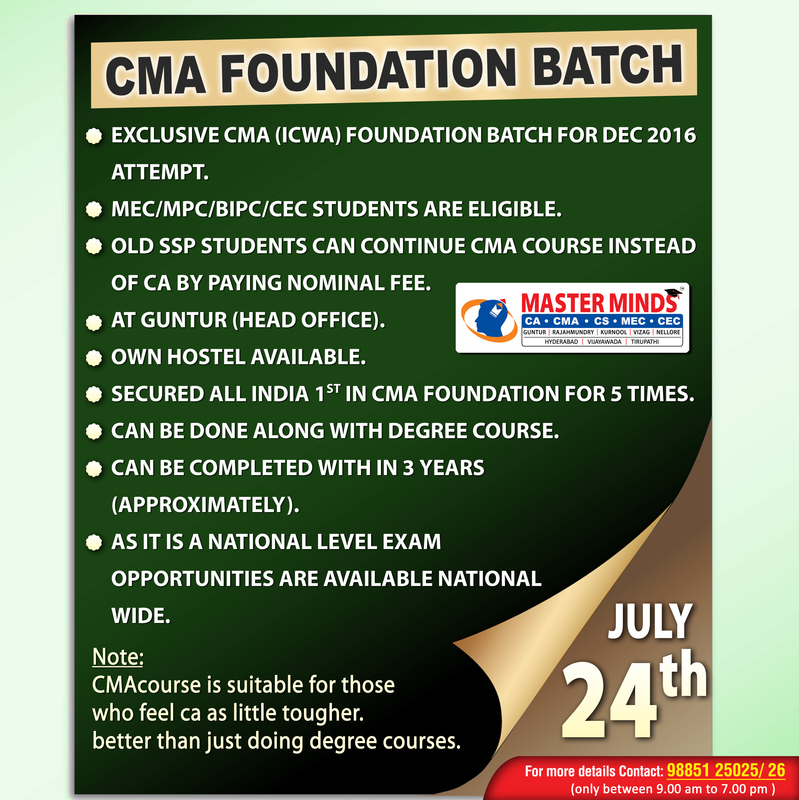 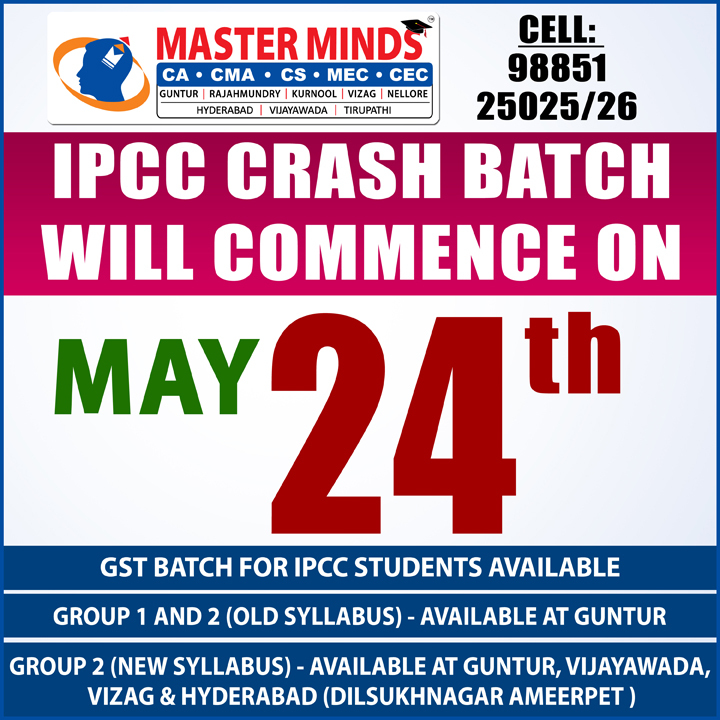 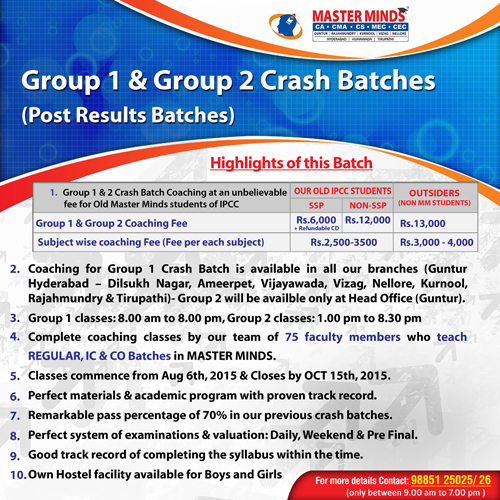 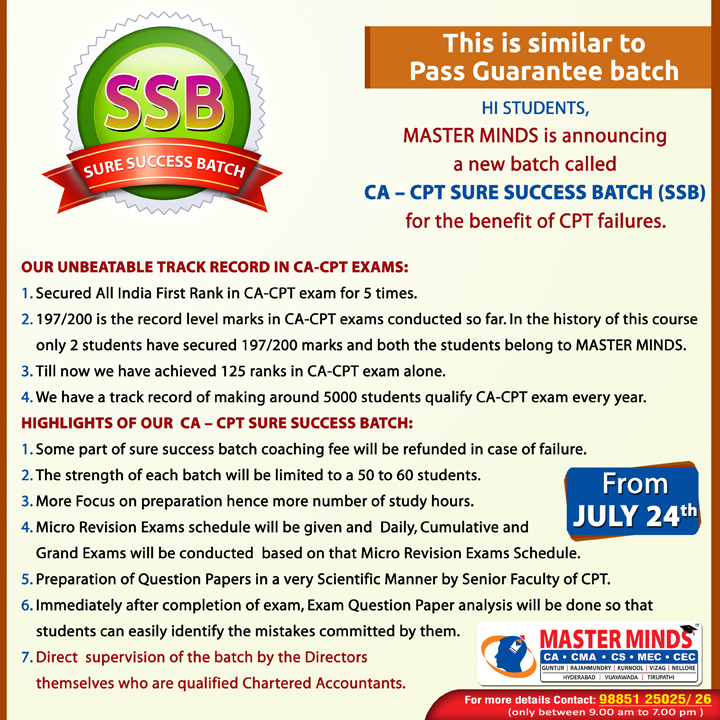 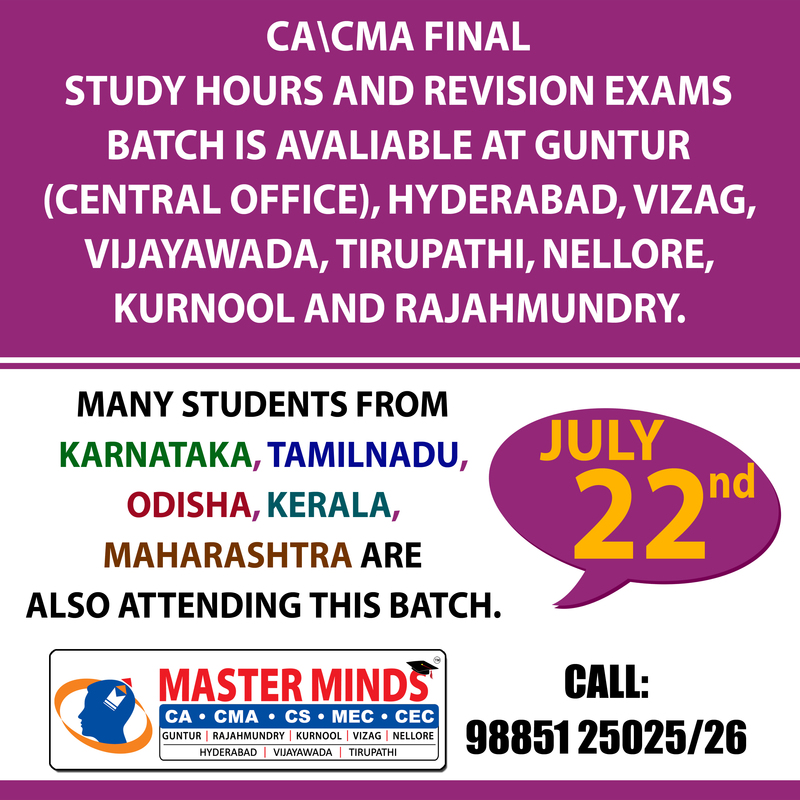 Next CA – CPT Crash / Short Term Batch will commence on Mar 24th (AT Guntur, Rajahmundry and Kurnool). For Details call to 9248733315. 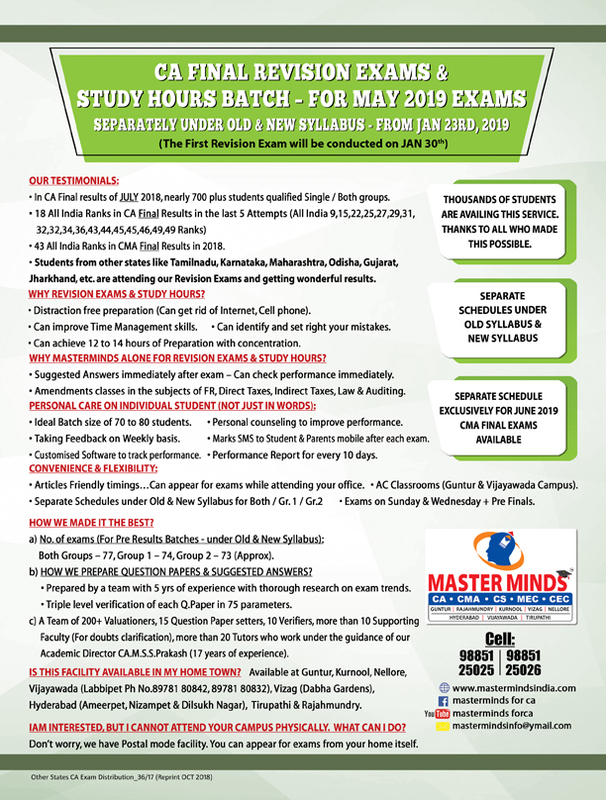 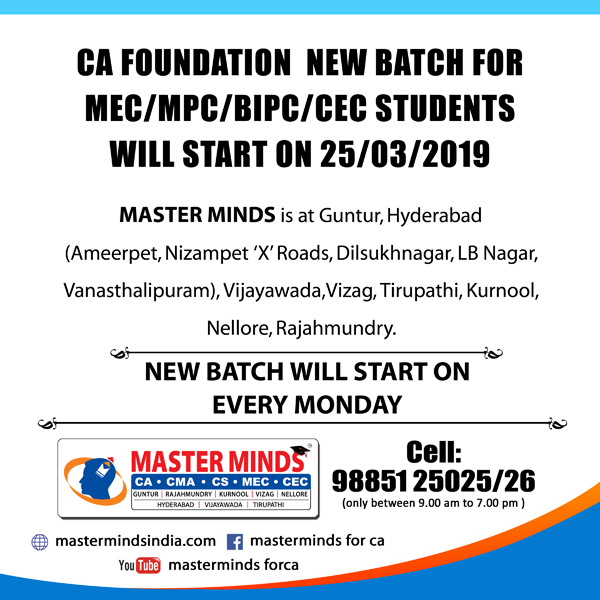 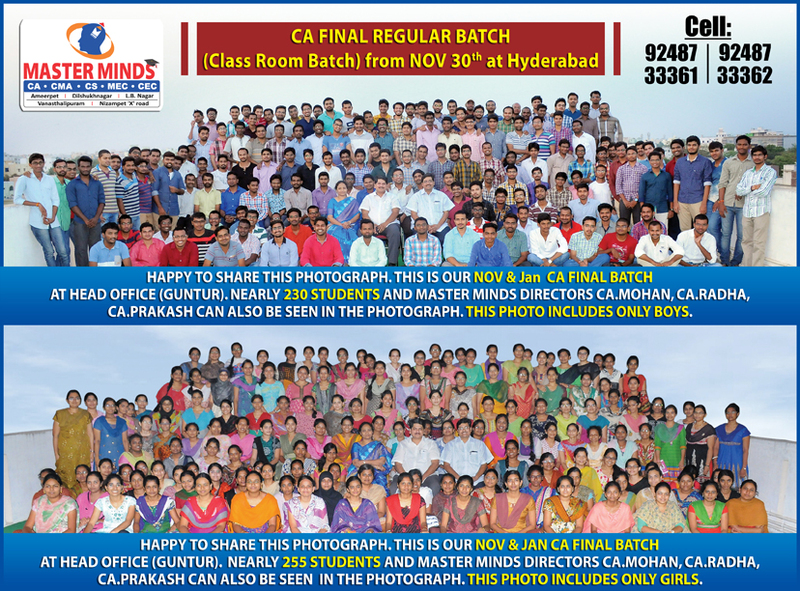 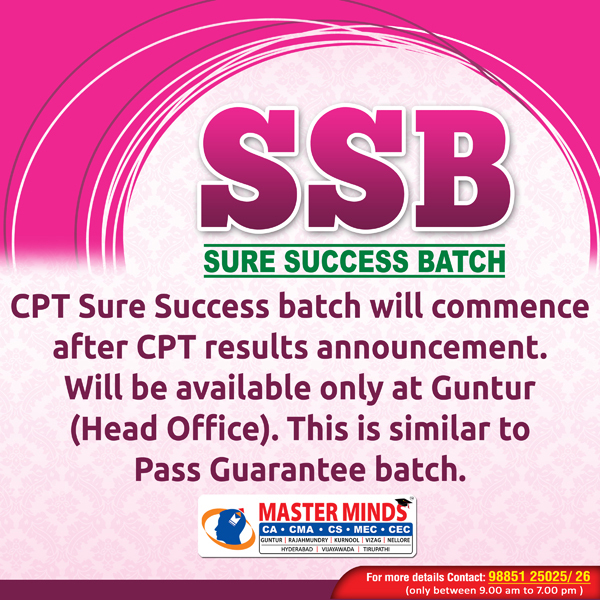 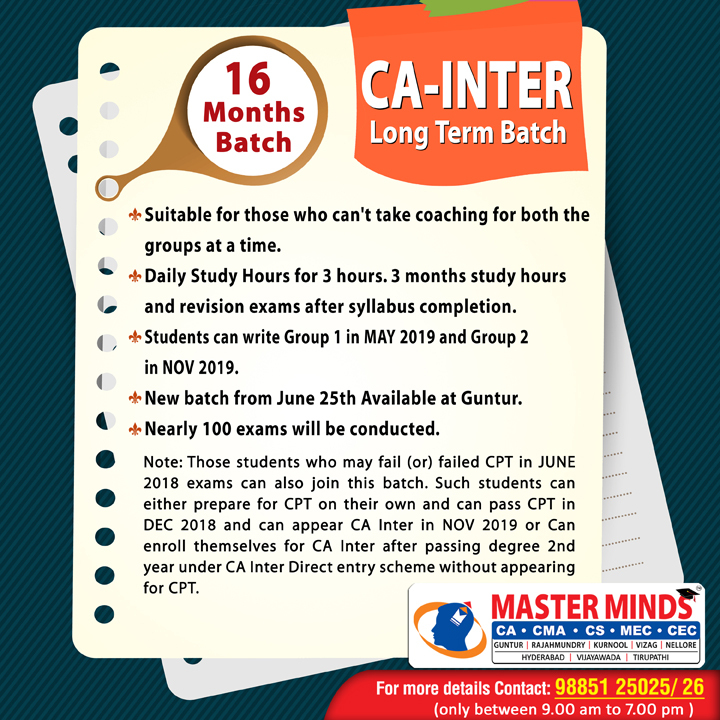 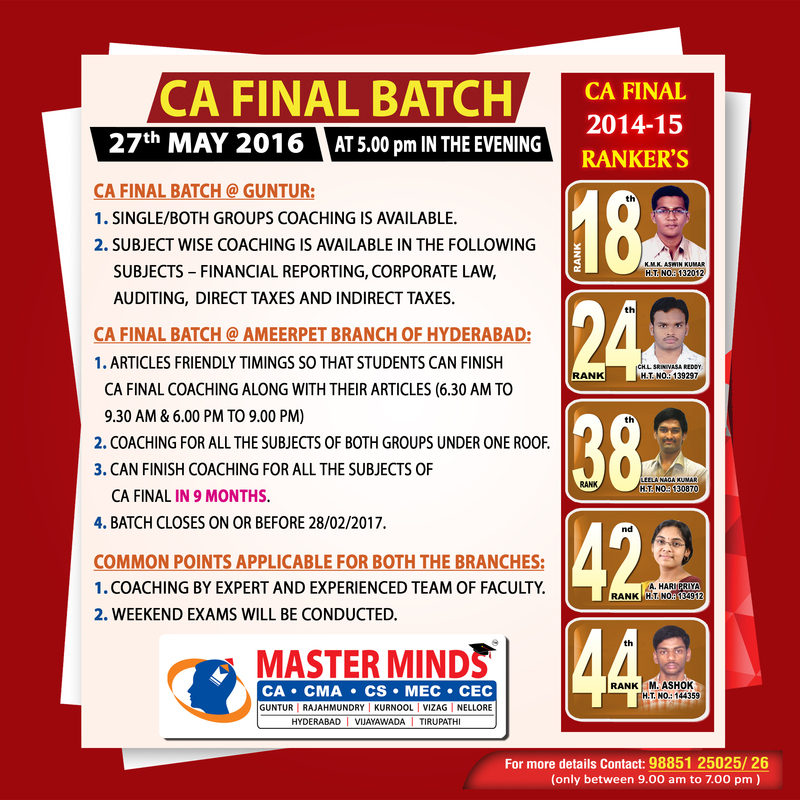 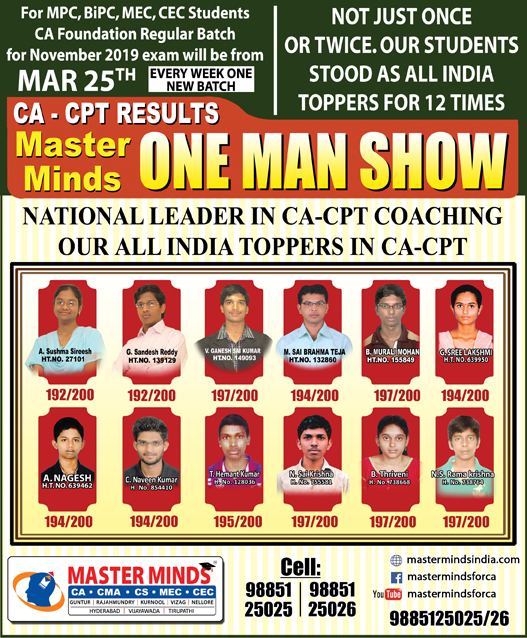 Next CA – CPT Regular / Long Term Batch will commence on Mar 31st (AT Guntur, Rajahmundry and Kurnool). For Details call to 9248733315. 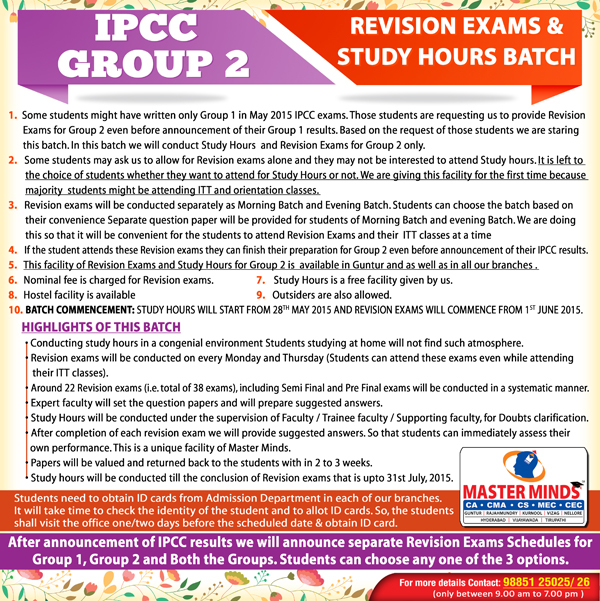 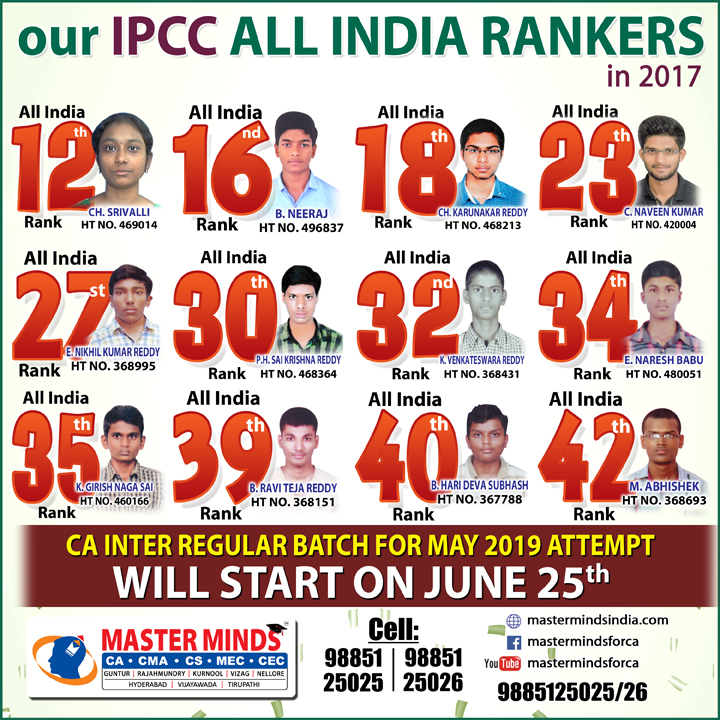 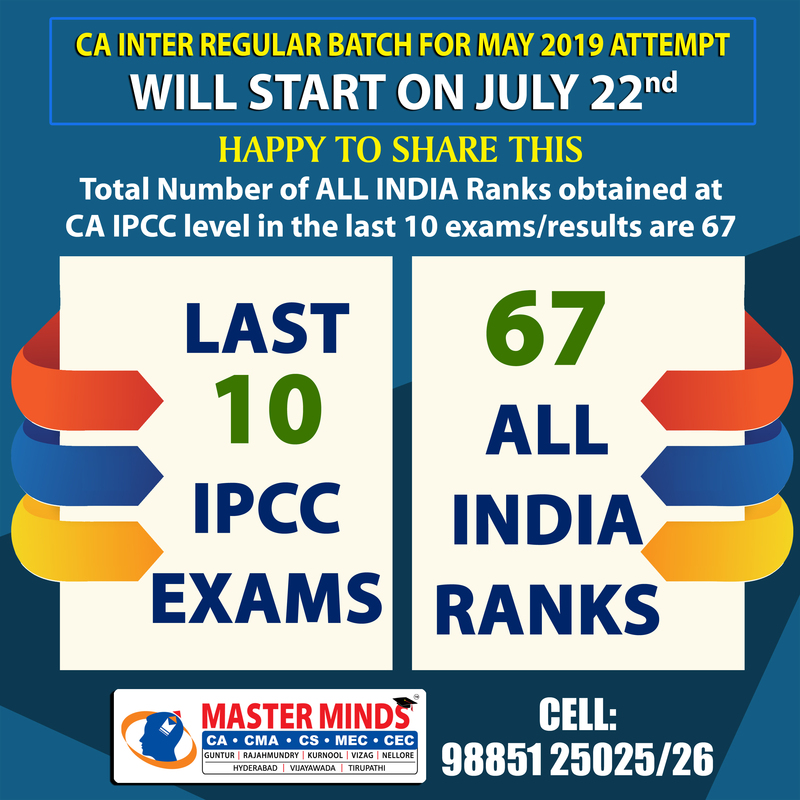 IPCC 22ND BATCH COMMENCING FROM JUNE 28TH. 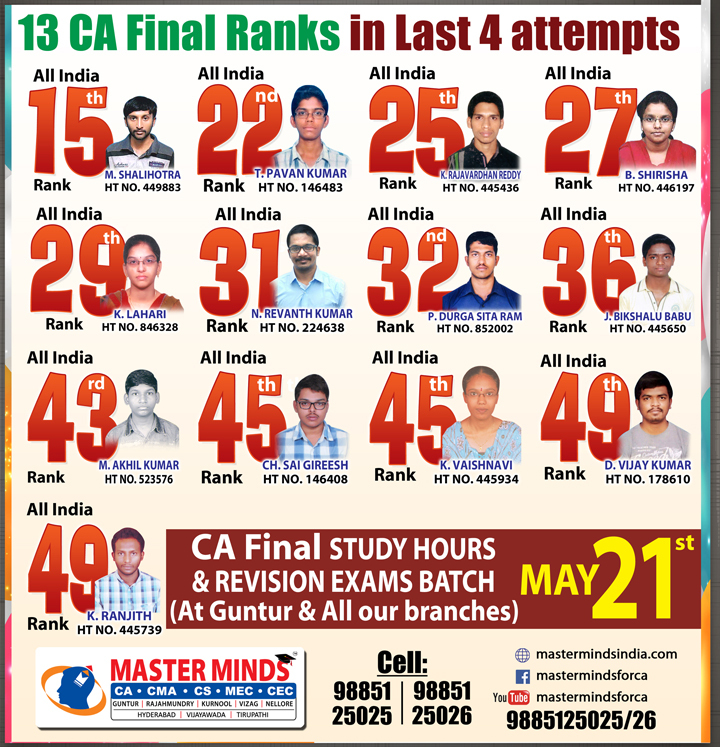 TEACHING BY 10 CA’S + 2 CWA’S + 1CS. 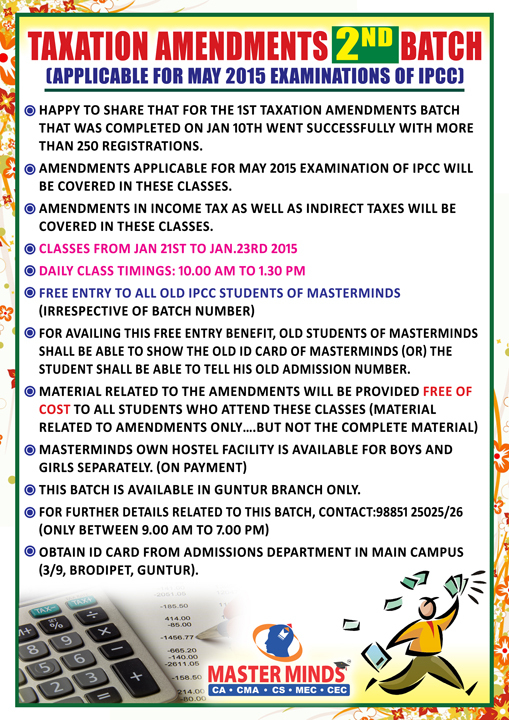 FEE WILL BE REVISED FROM JULY 1ST. 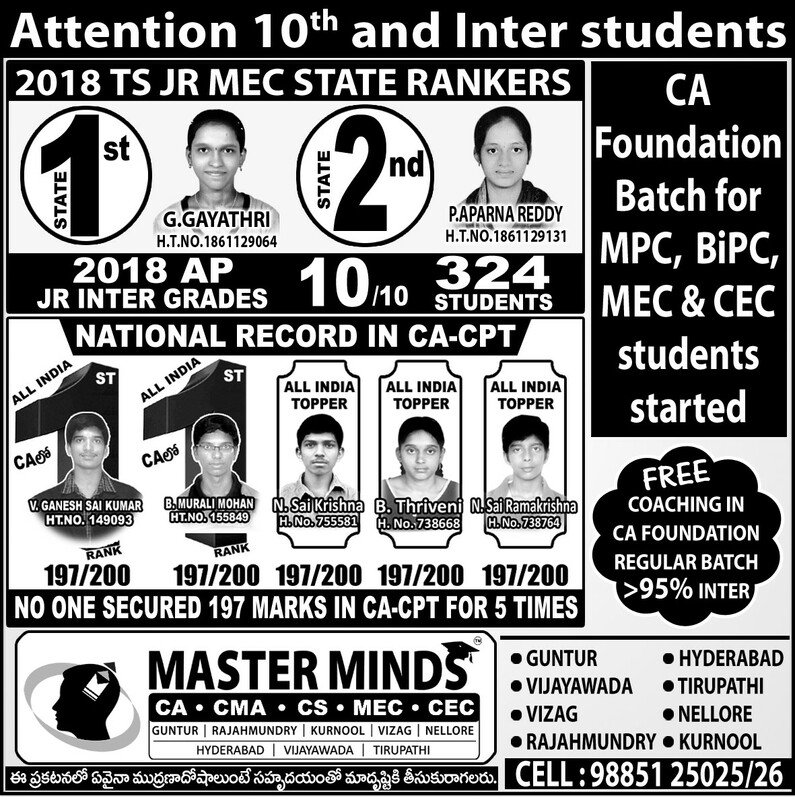 RUSH IMMEDIATELY. 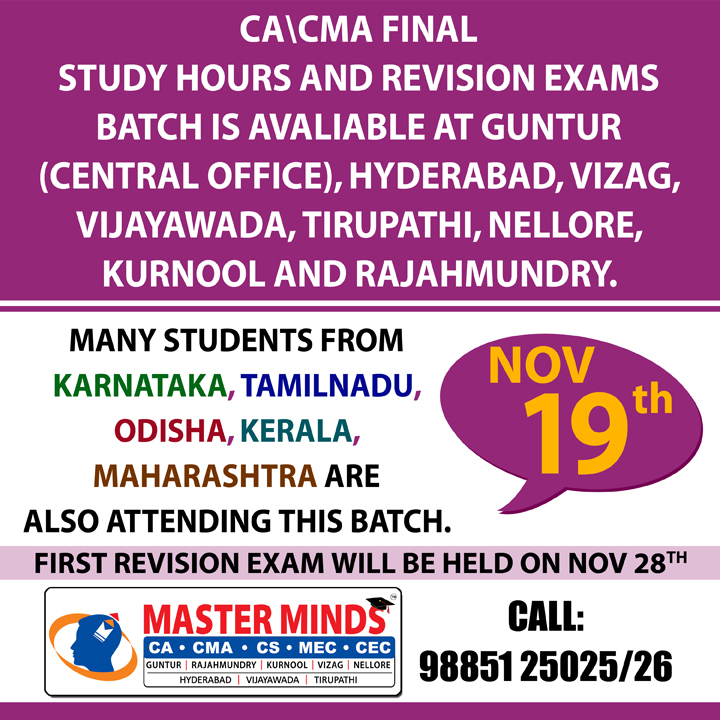 FOR DETAILS 9248733315. 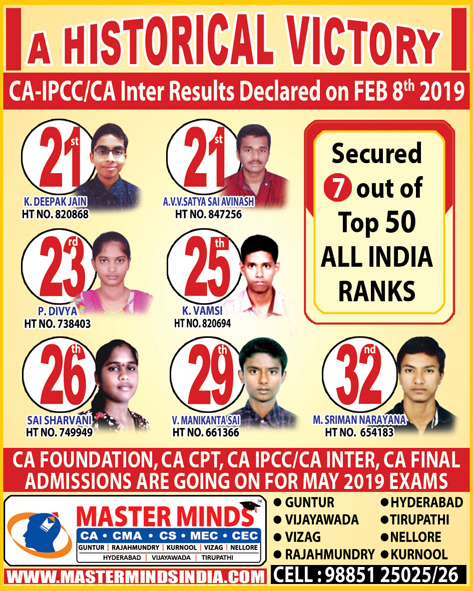 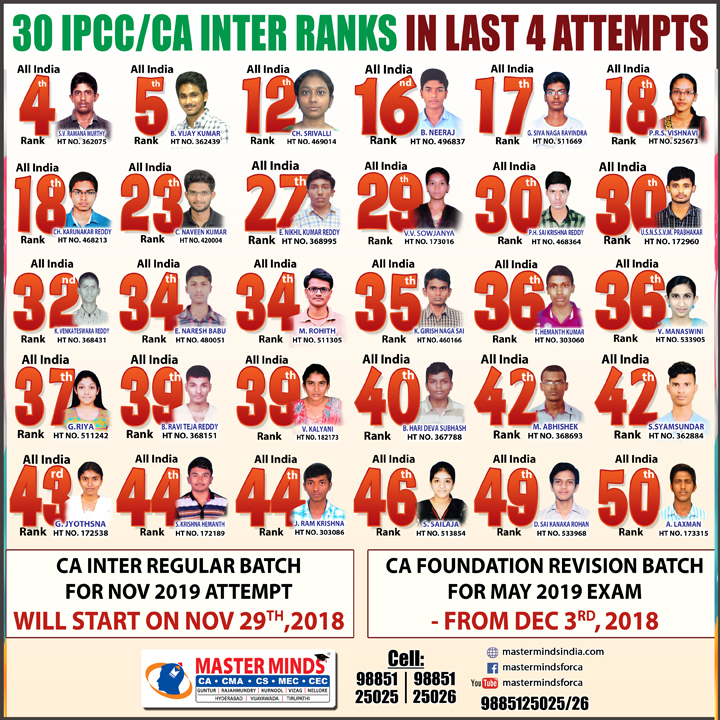 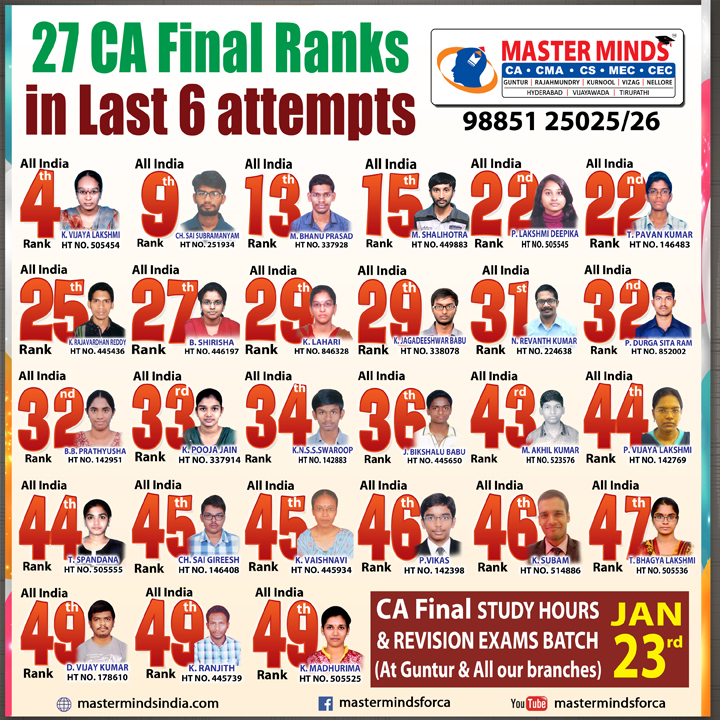 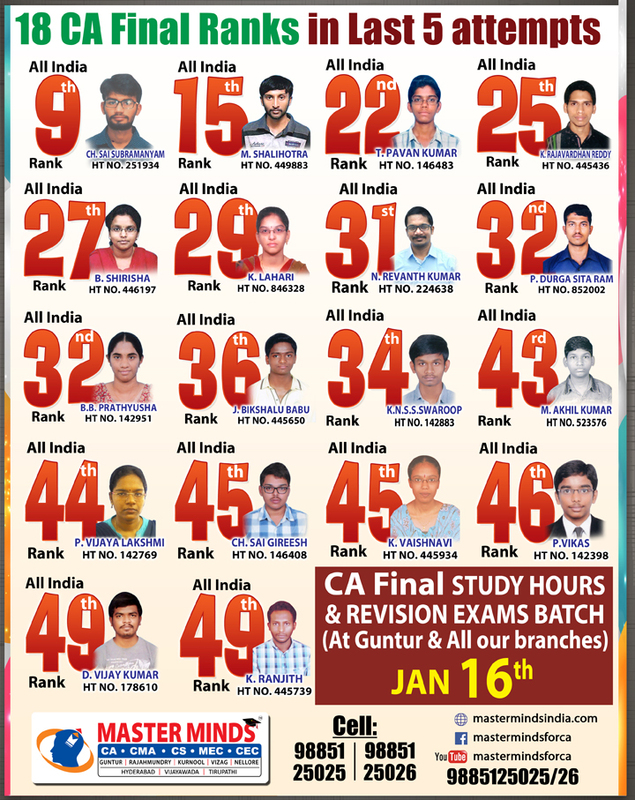 CA CPT ADMISSIONS ARE GOING ON. 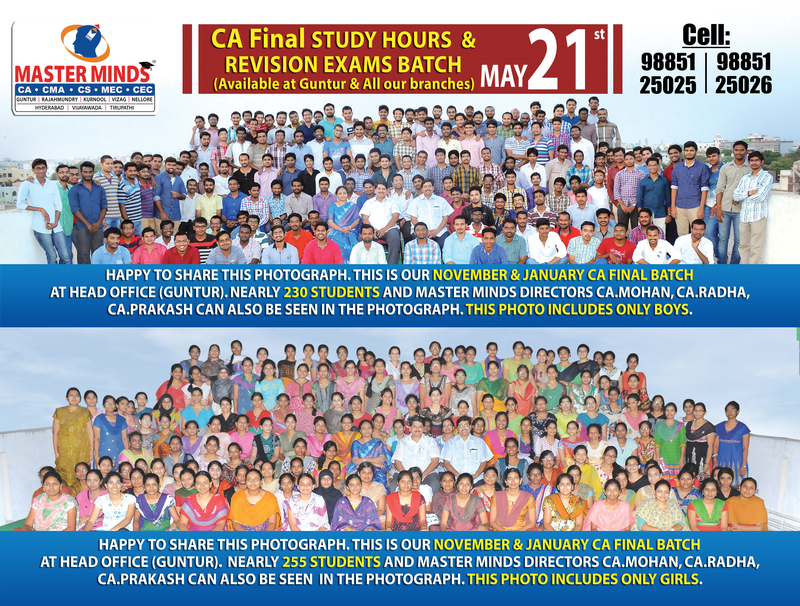 CROSSED 2000 ADMISSIONS. 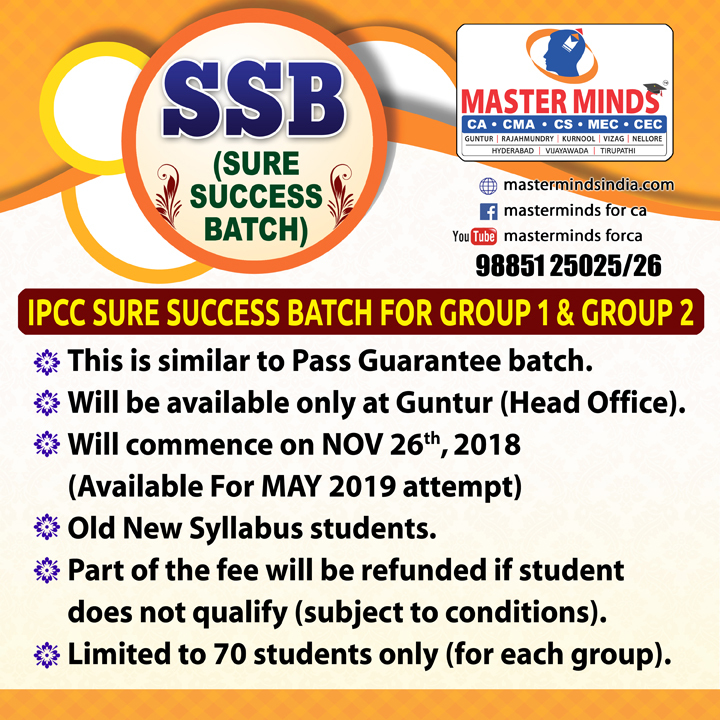 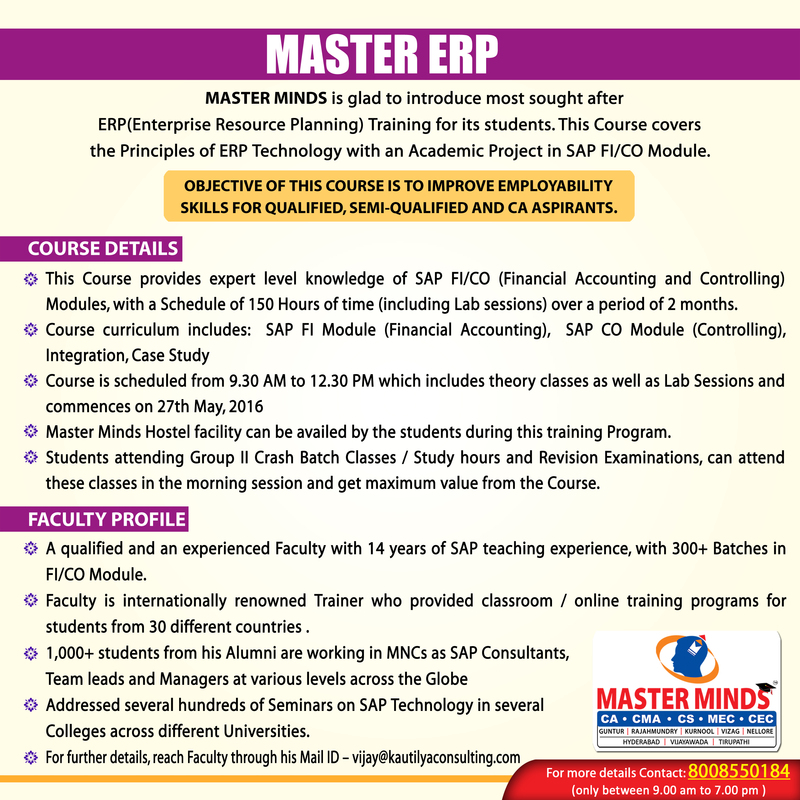 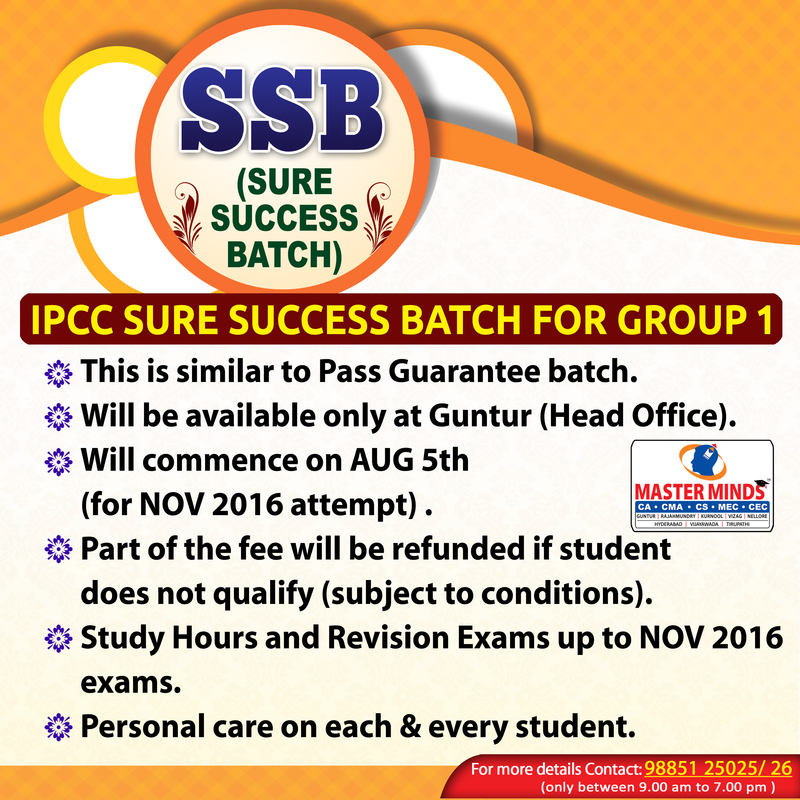 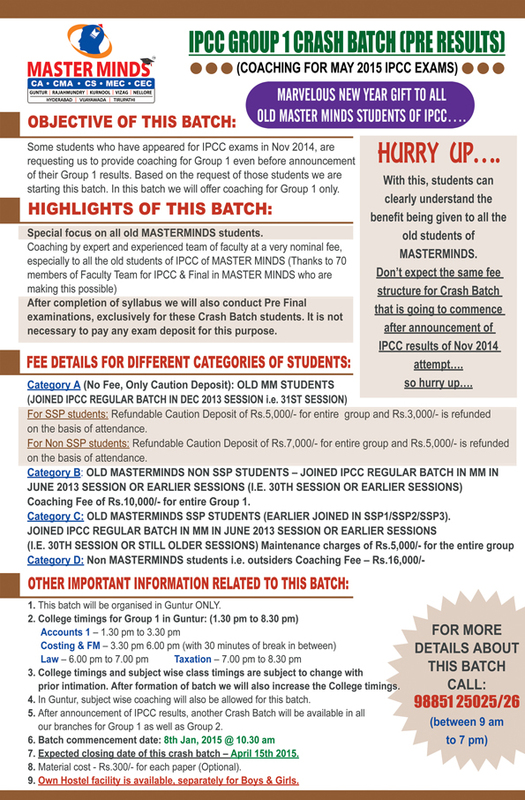 SPECIAL BATCH FOR MPC STUDENTS. 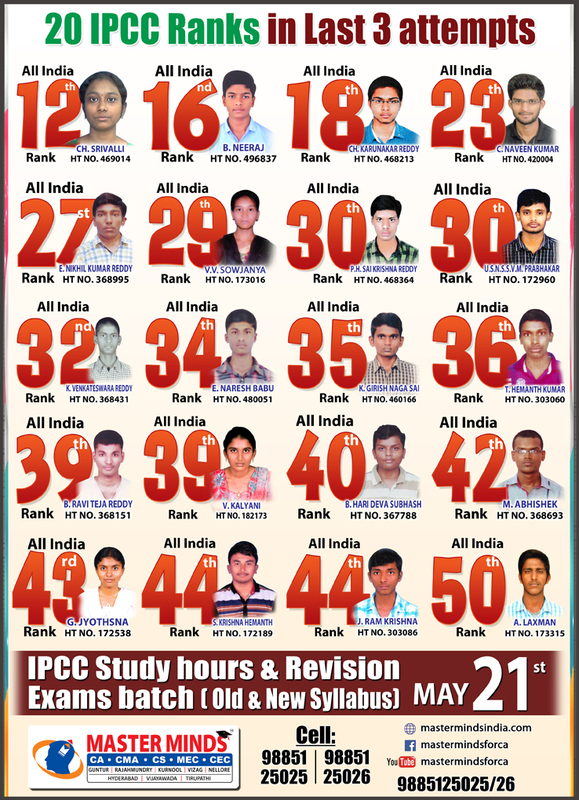 MPC STUDENT GOT ALL INDIA 1ST. 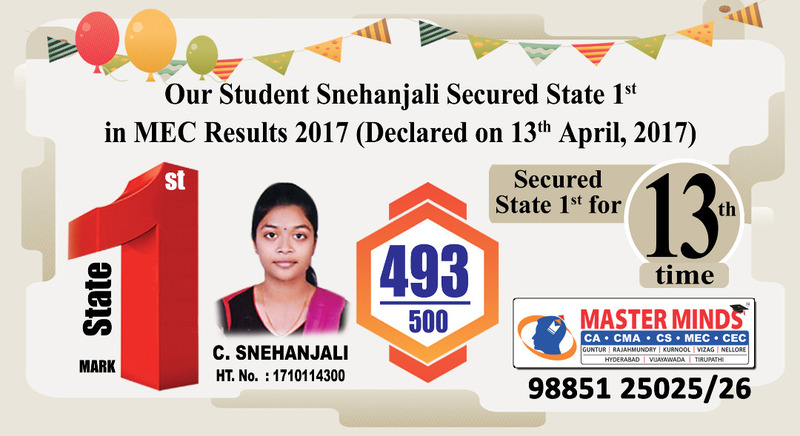 DETAILS CALL 9885125026. 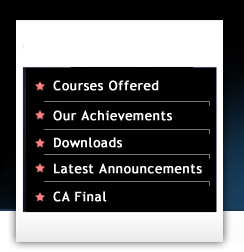 For CA final May 2010 exams, thorough knowledge of AS 30, 31, 32 not required. 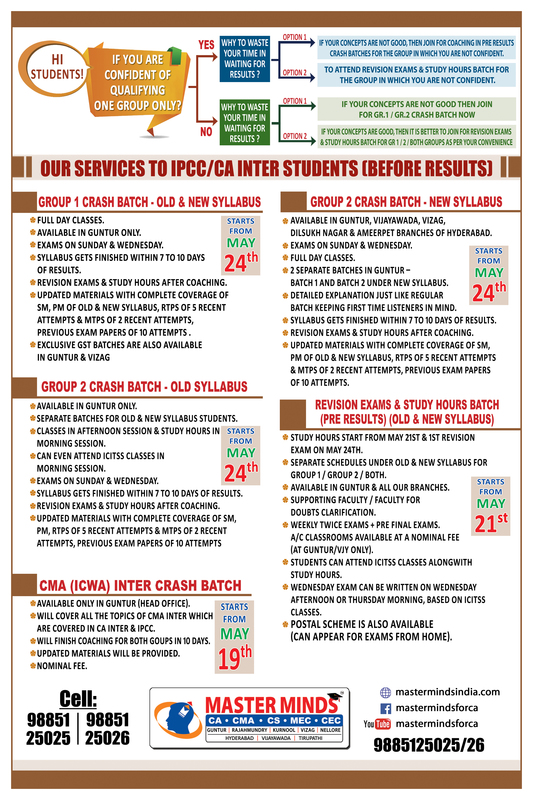 Clarification given by ICAI. 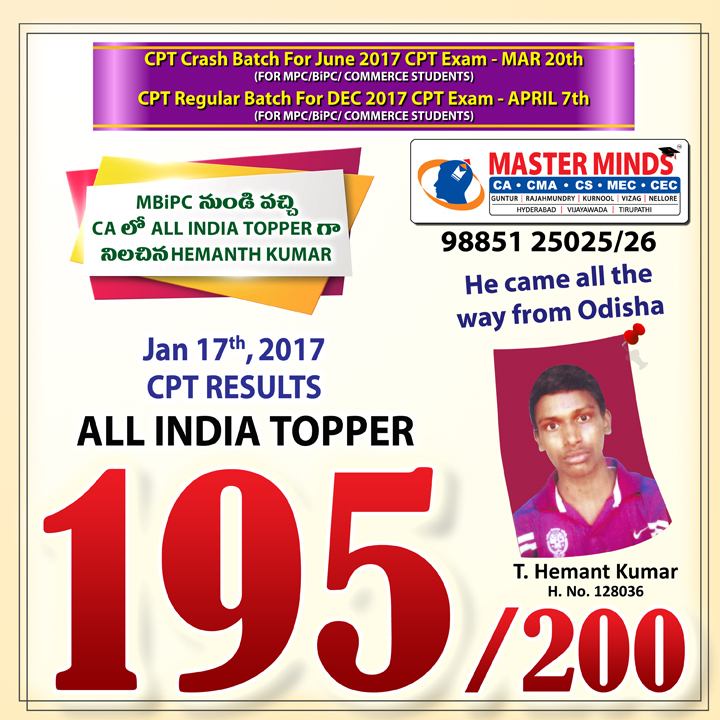 Our student I.ASHOK KUMAR (H. T No. 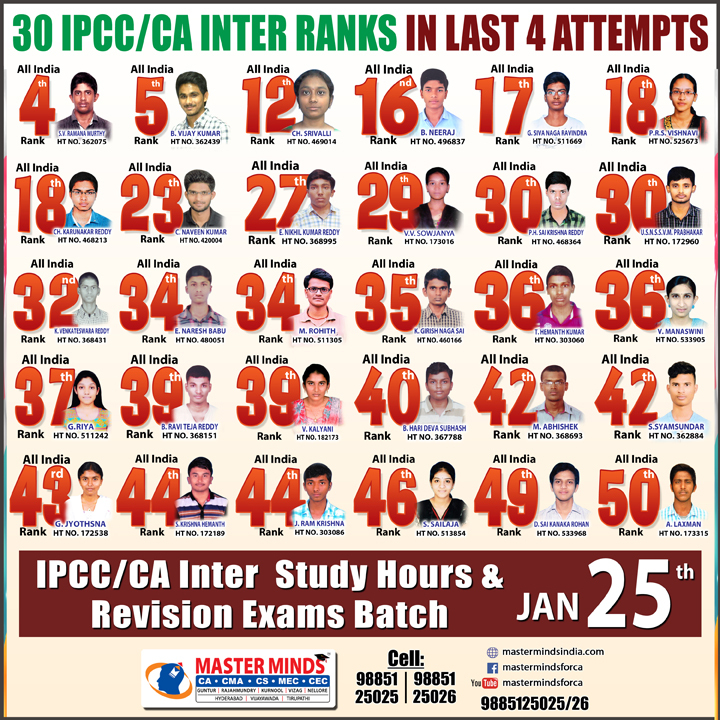 29289) got All India 30th rank in todays IPCC results. 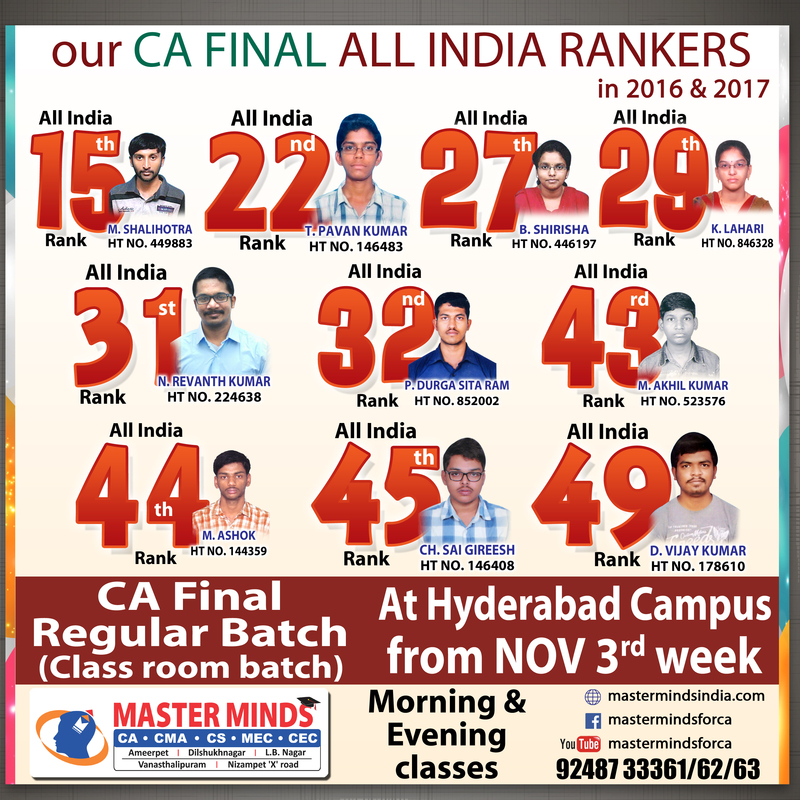 Only institute in AP to get ALL India rank this time. 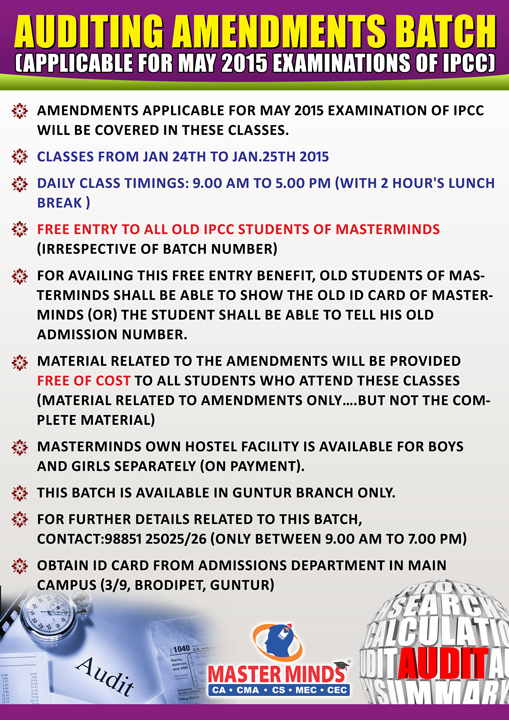 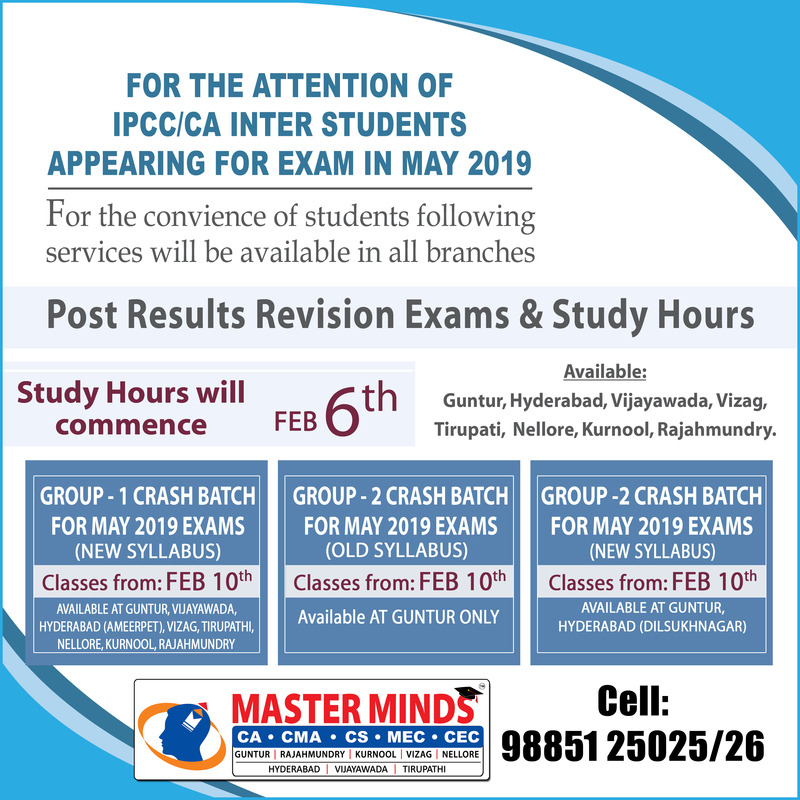 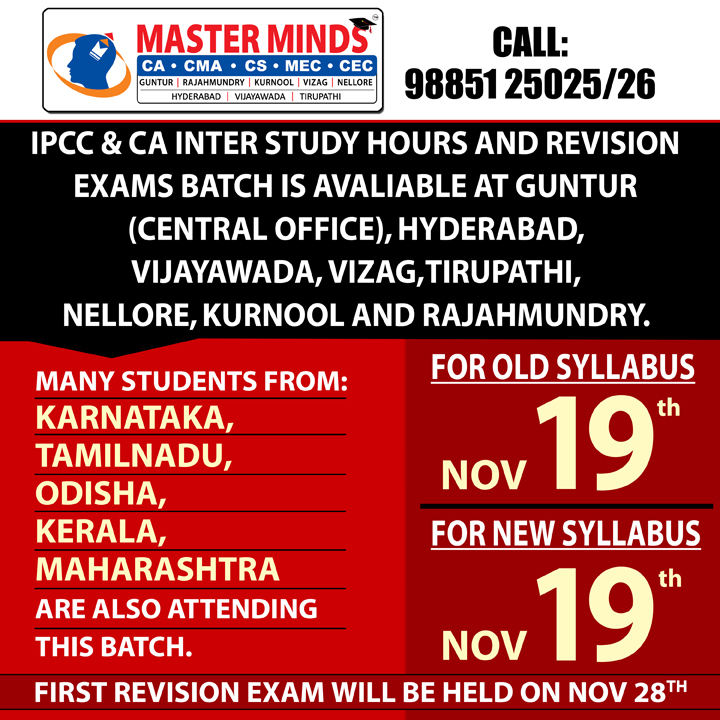 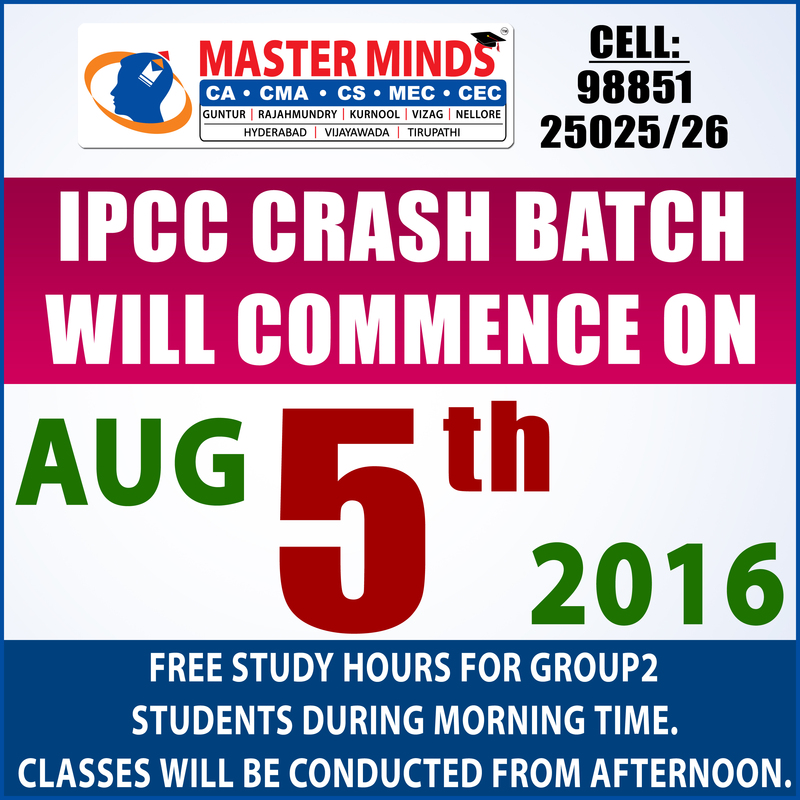 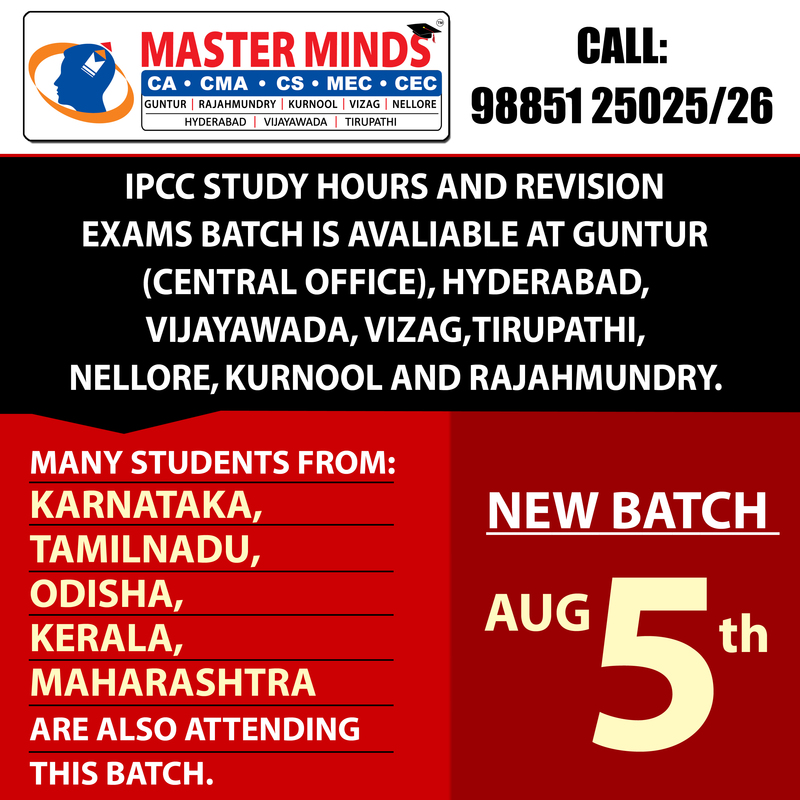 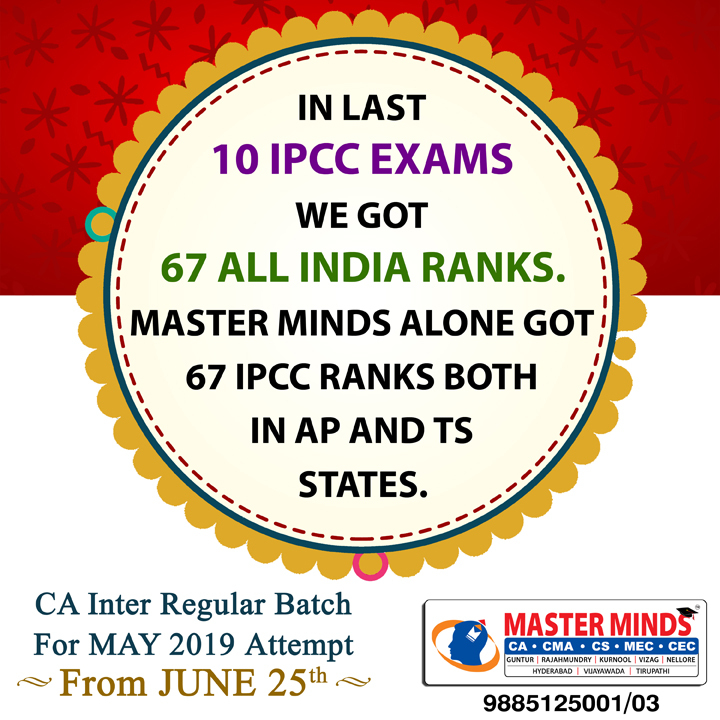 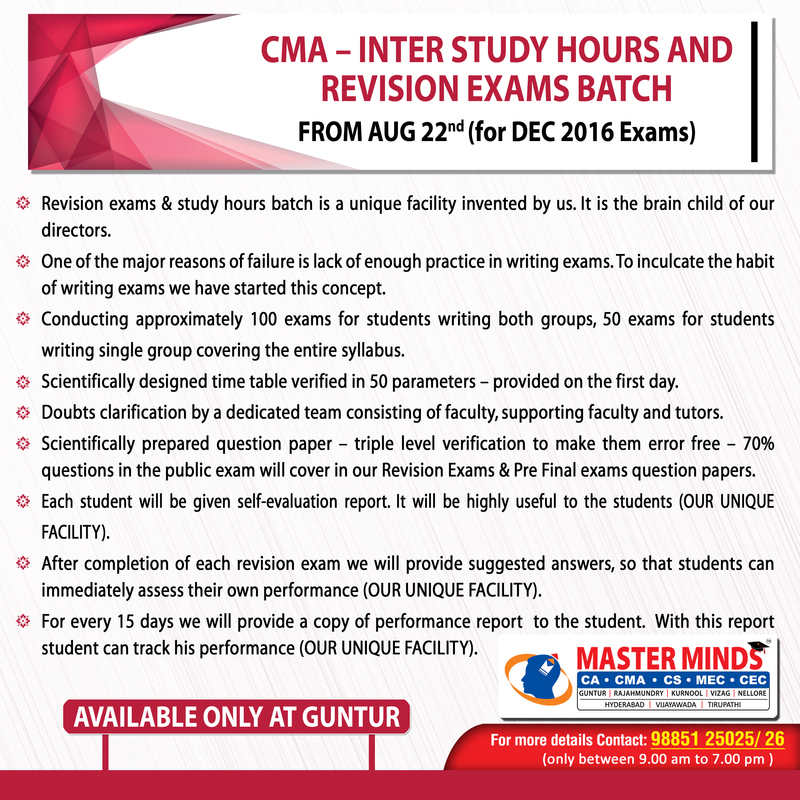 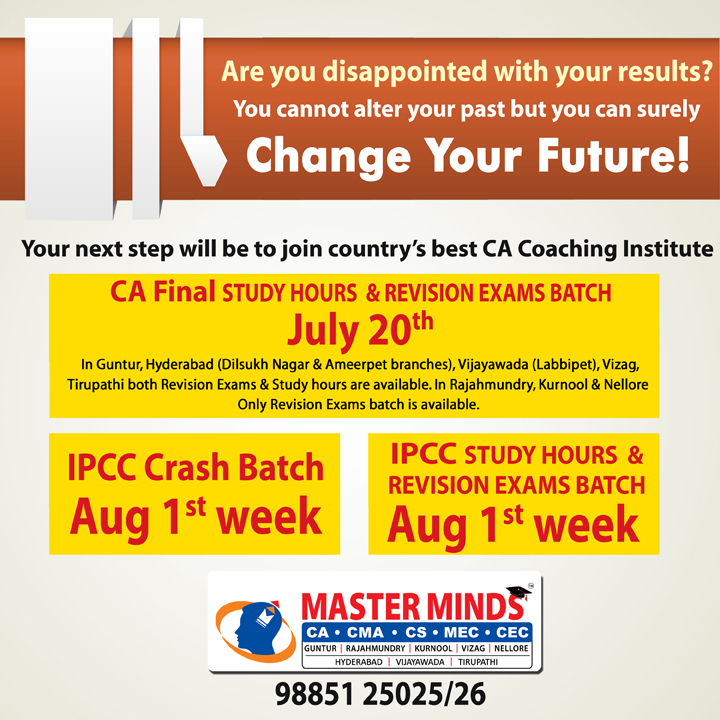 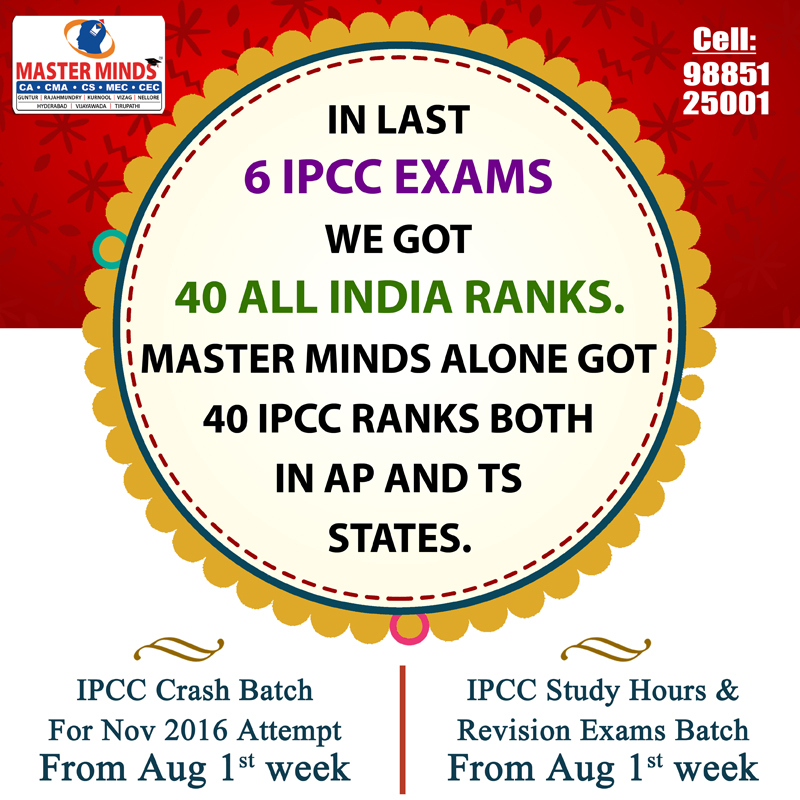 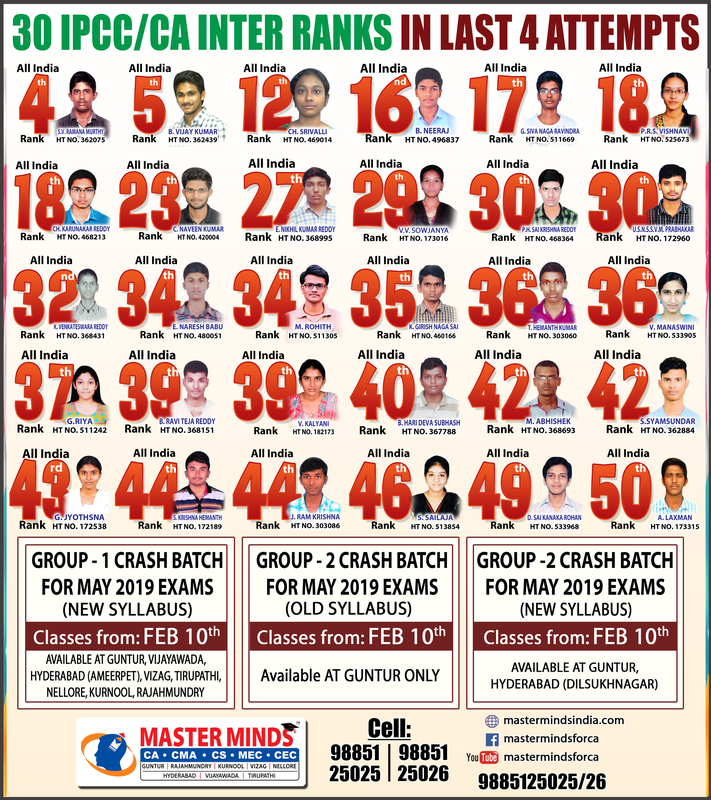 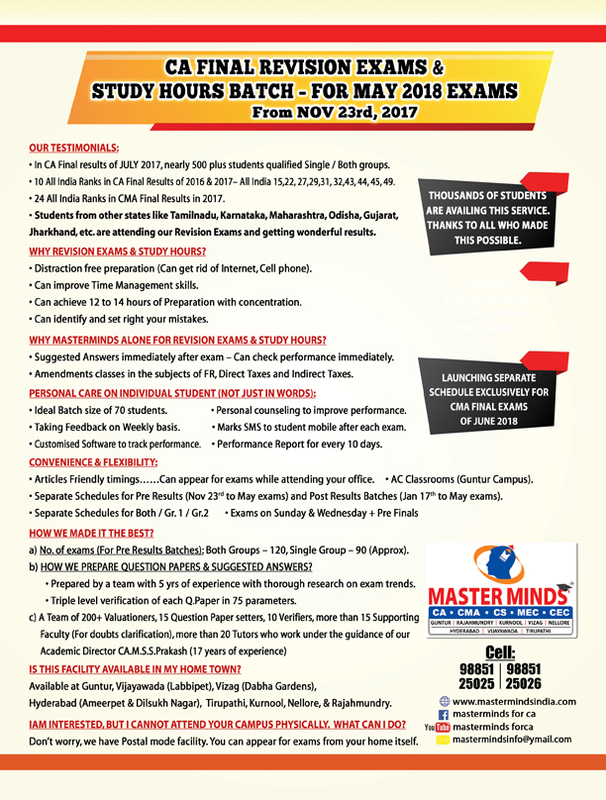 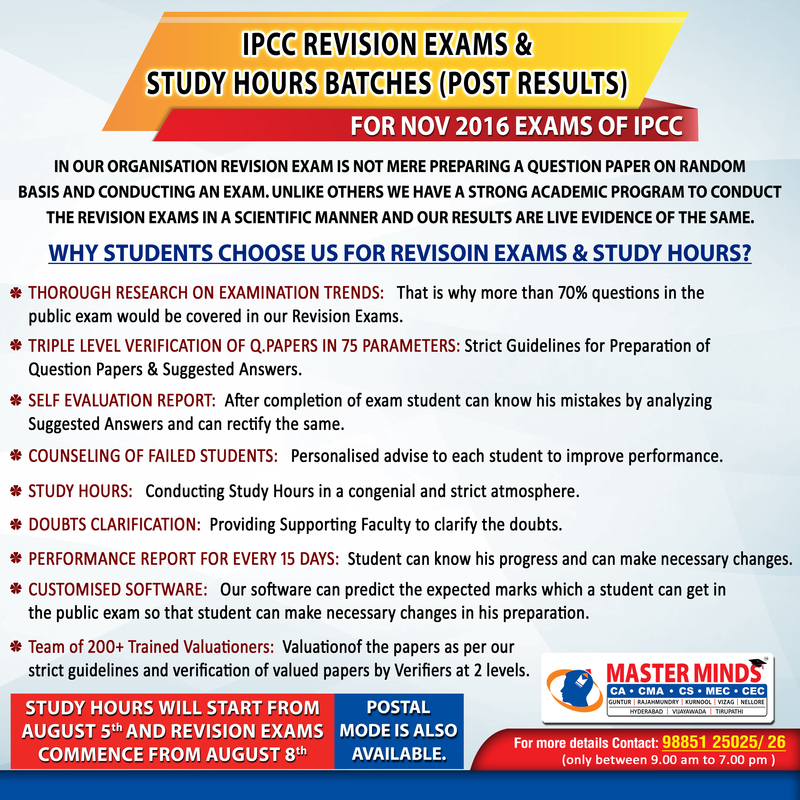 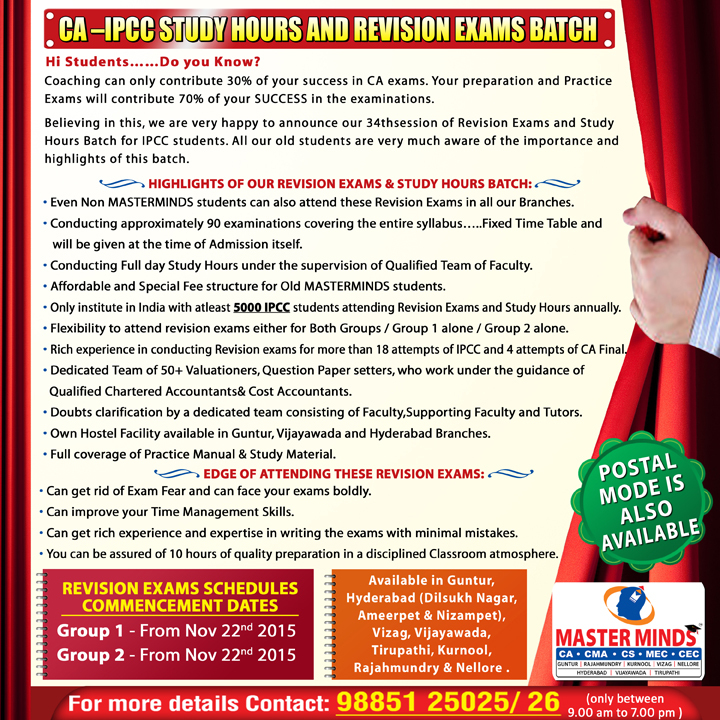 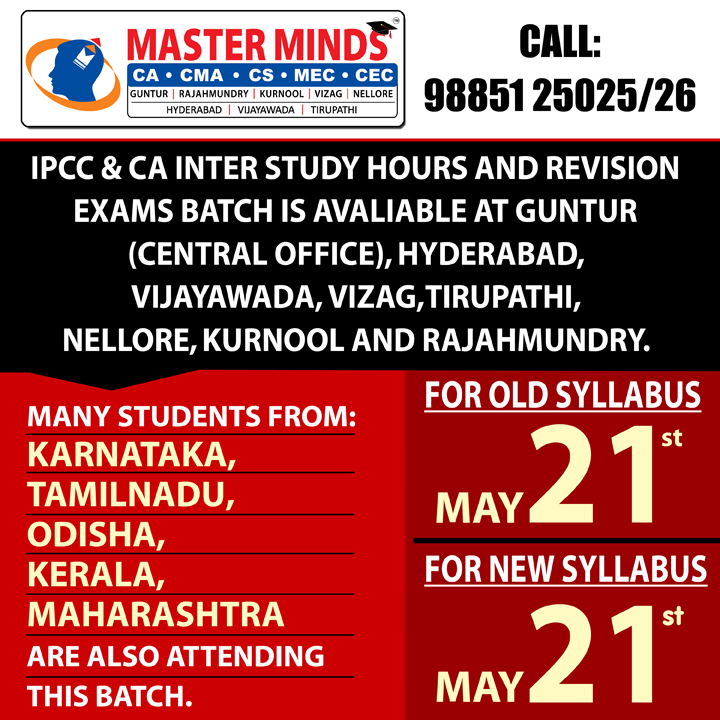 Free Revision classes for PCC/IPCC failed old Master Minds students. 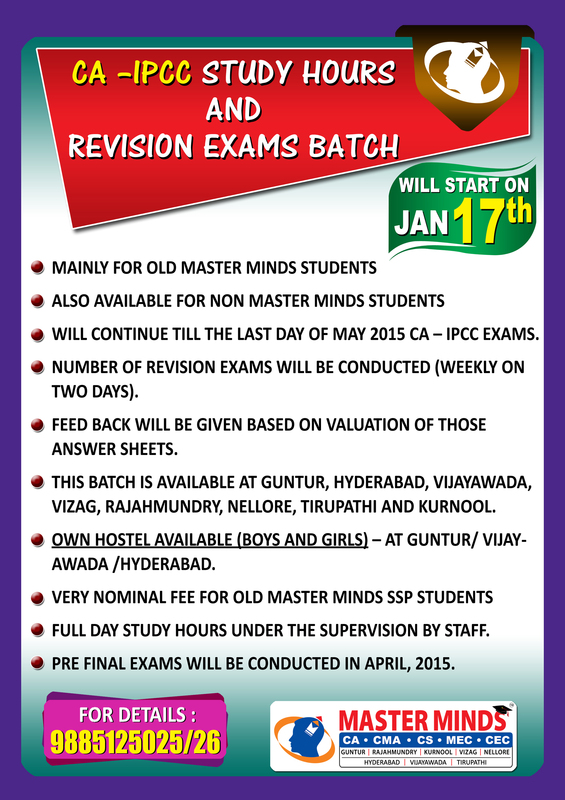 Details call Mr. Madhu 9248733313. 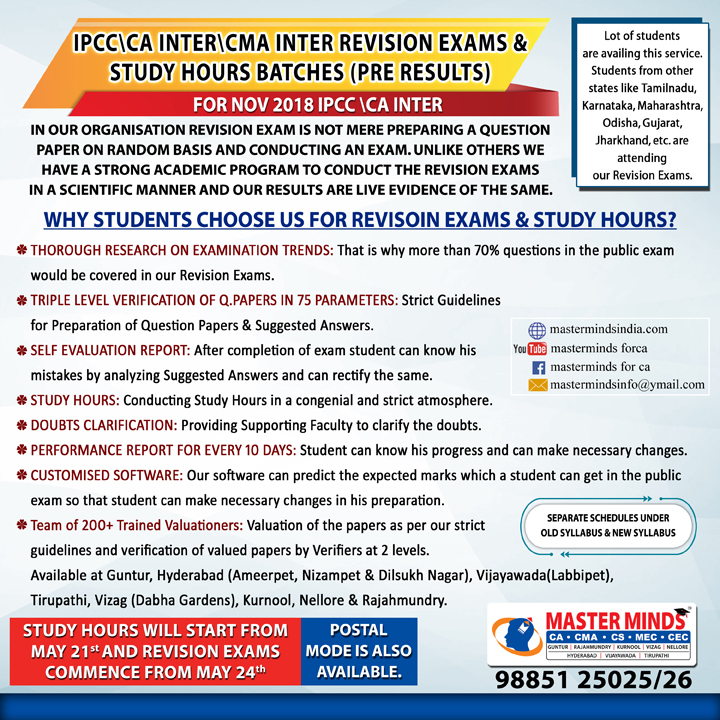 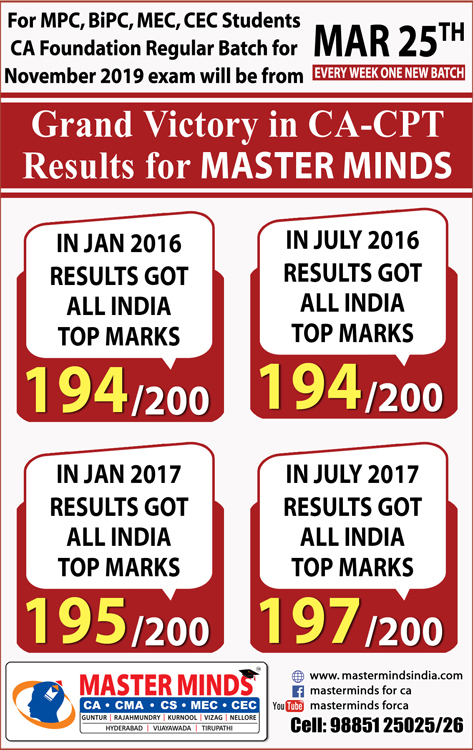 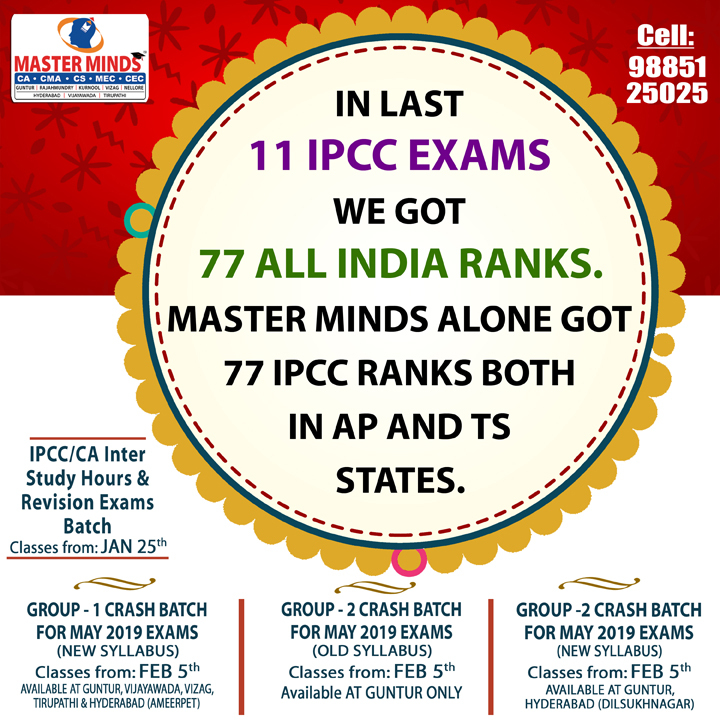 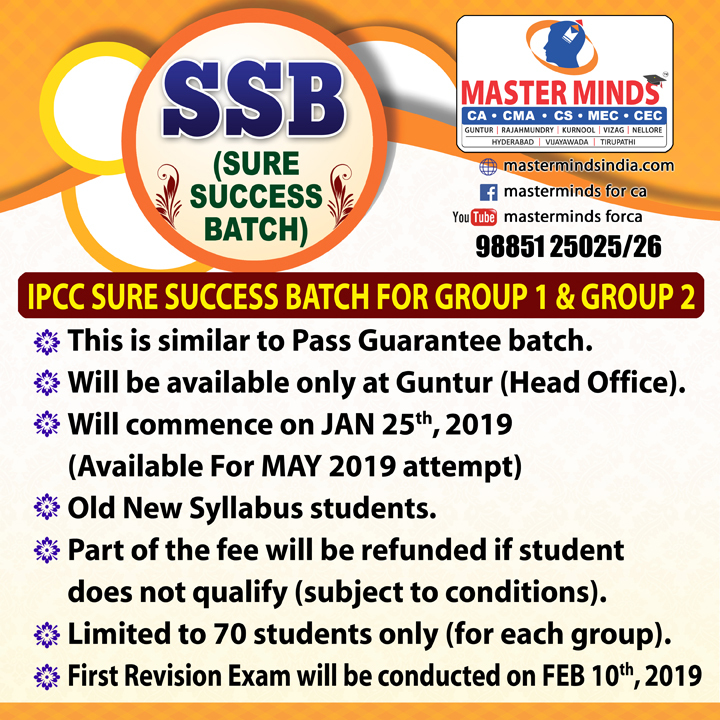 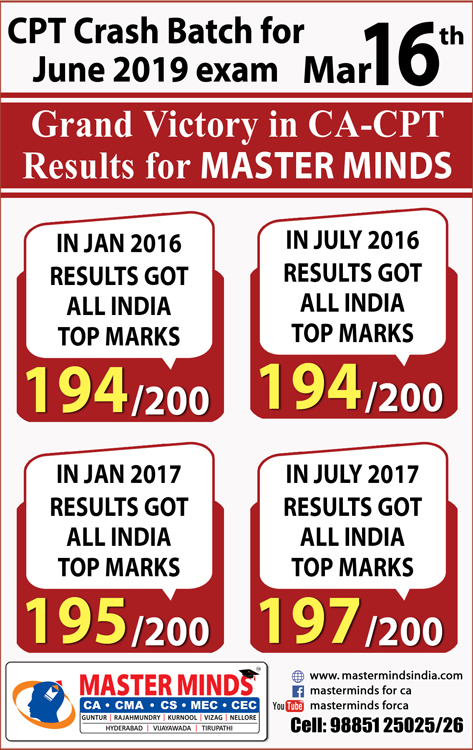 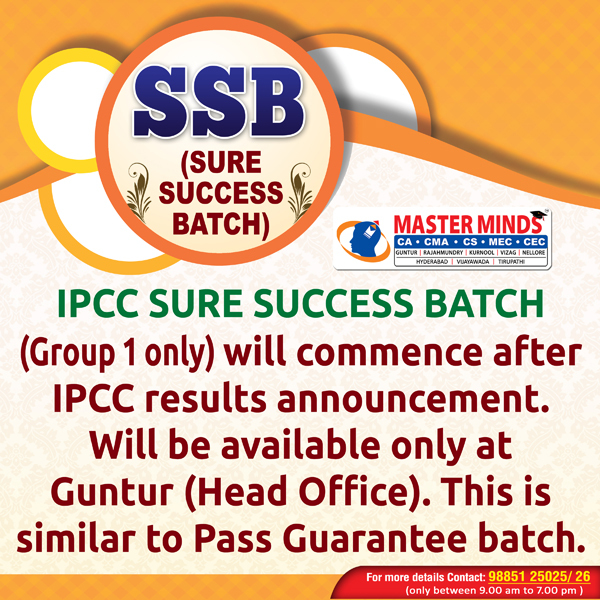 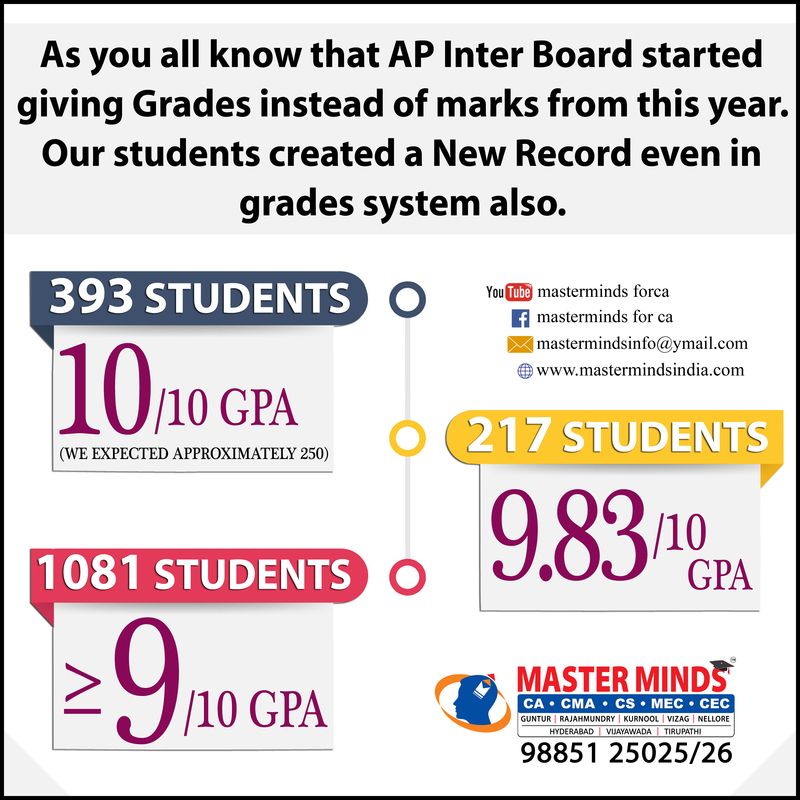 PE2/PCC/IPCC RESULTS ARE LIKELY TO BE ANNOUNCED ON JAN.29TH AT 2.OO P.M. CAN BE OBTAINED WWW.GNTMASTERMINDS.COM. 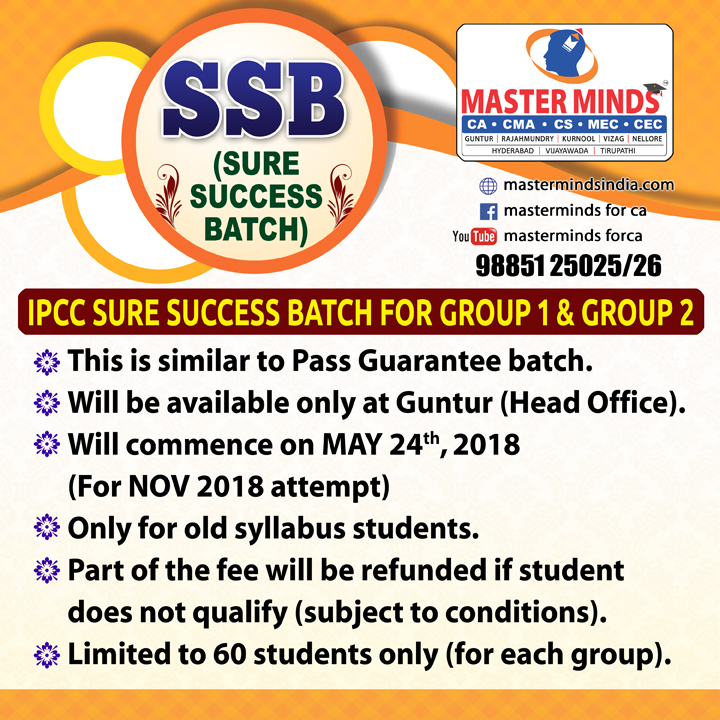 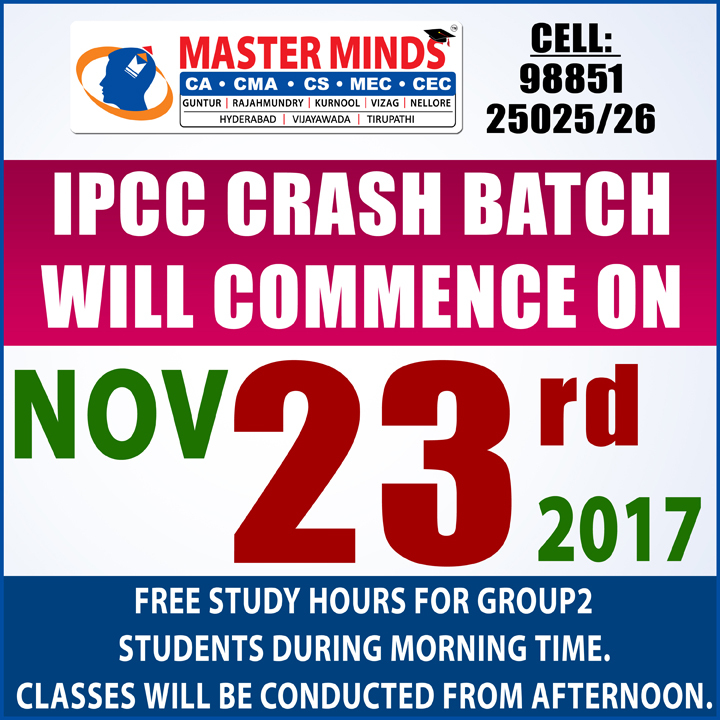 Next IPCC batch will commence on Dec' 26th followed by another batch on January' 18th. For more details call 98851 25025. 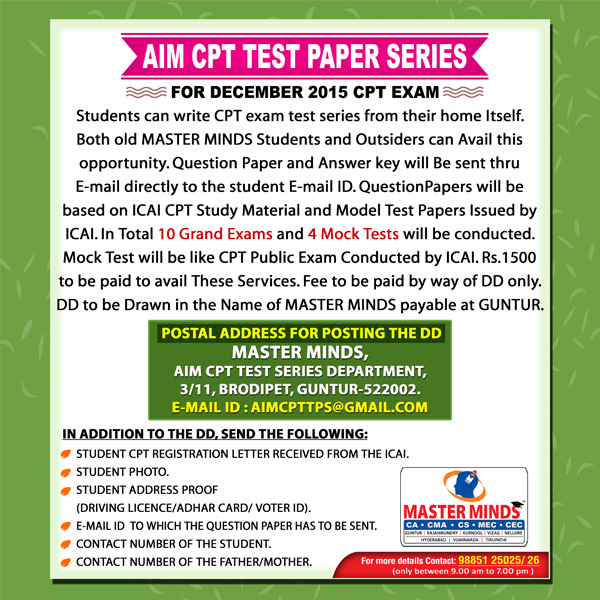 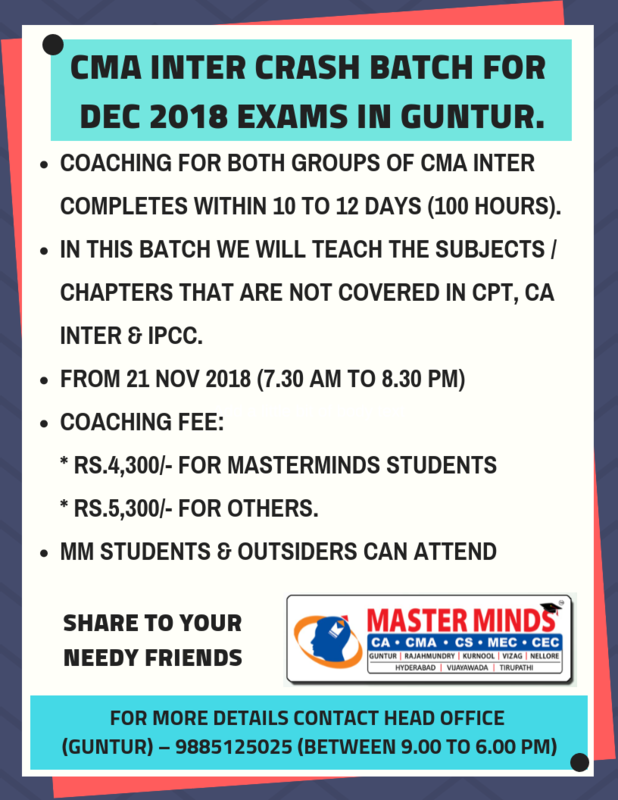 Guntur Branch of CA Institue is conducting CPT Model Exams on Dec' 6th. 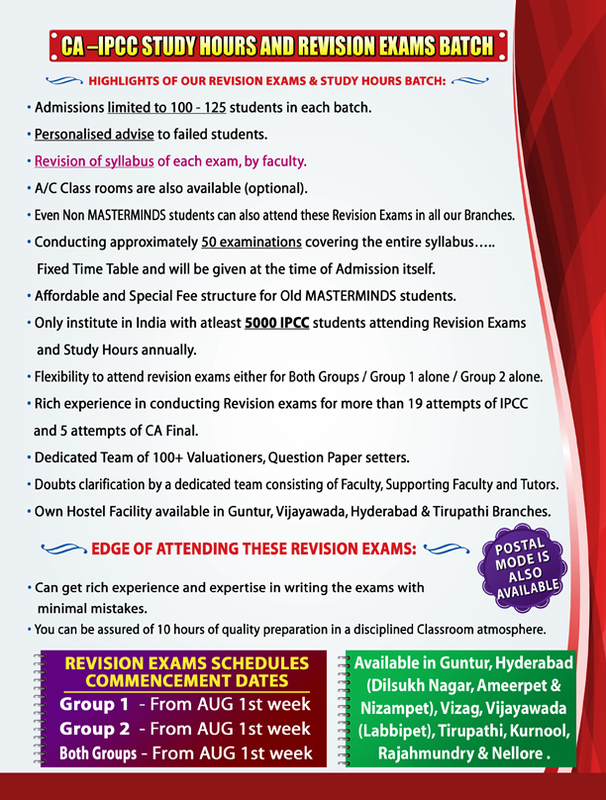 We recomand all our students to take of this Exam. 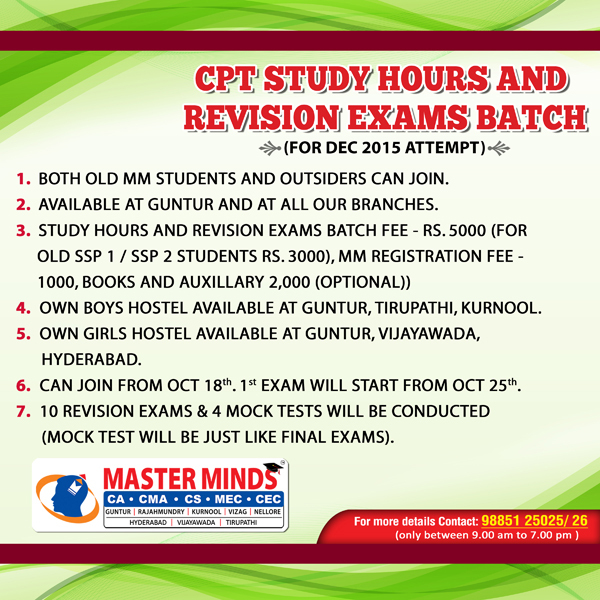 For details 924873316. 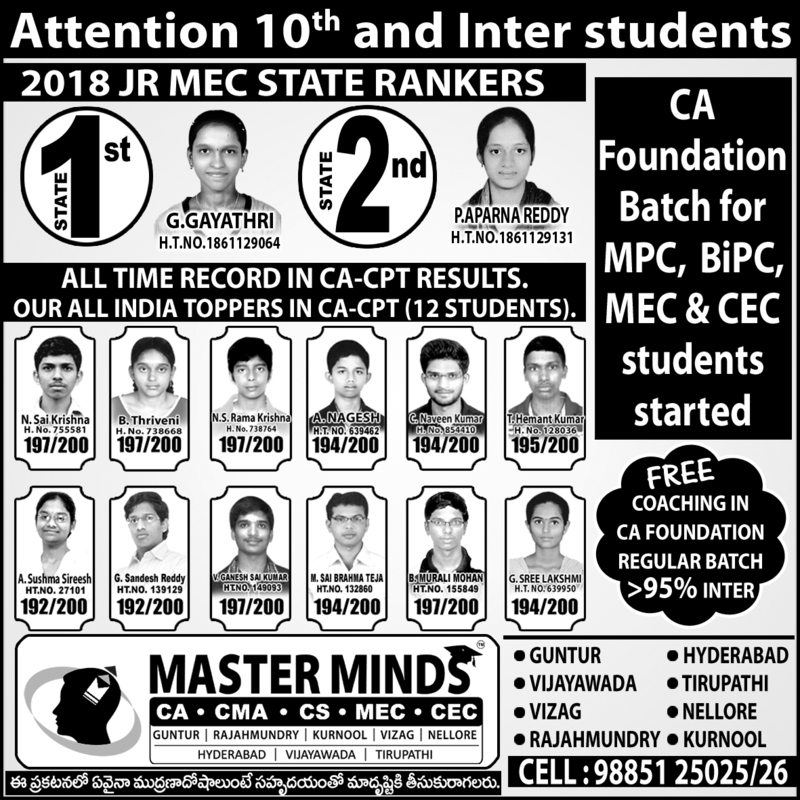 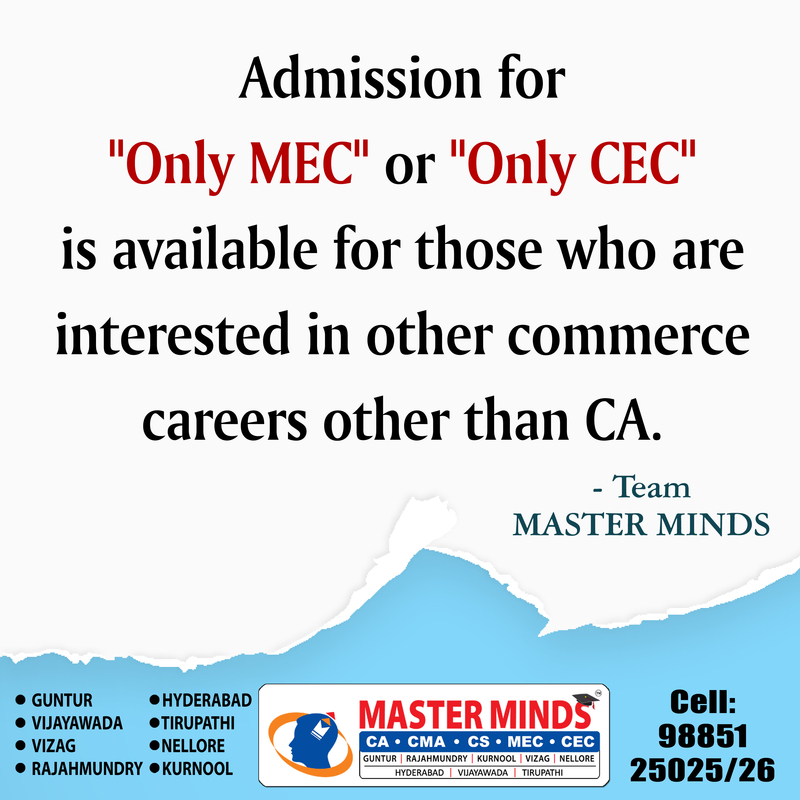 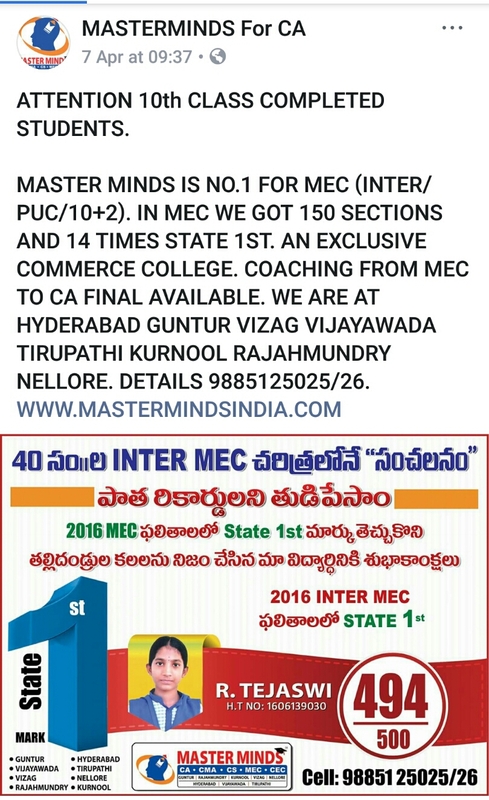 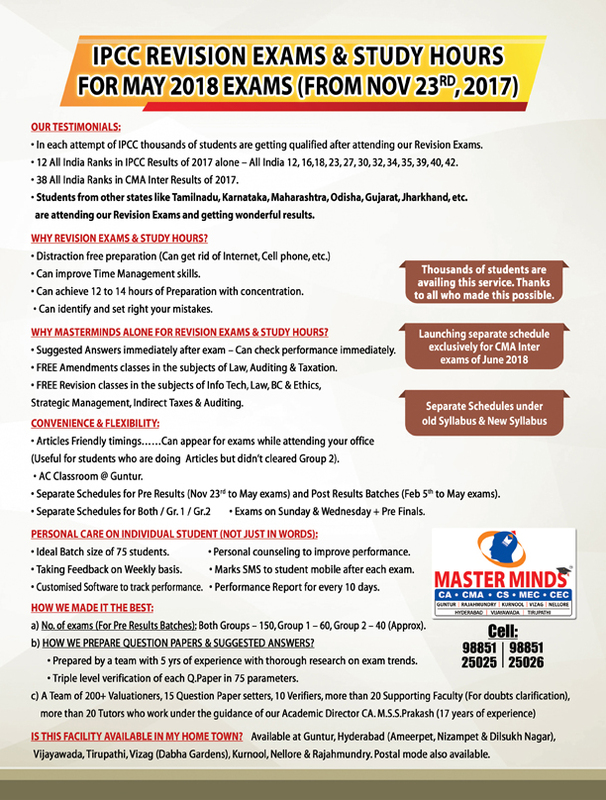 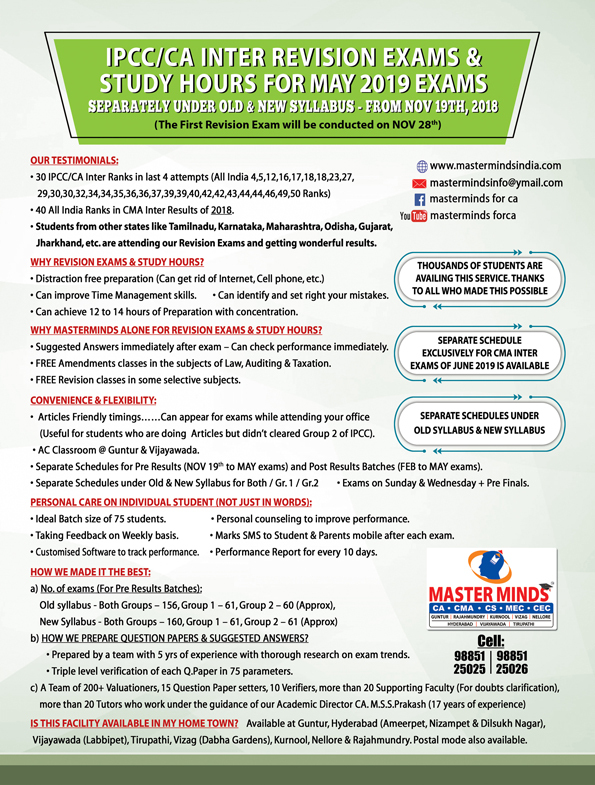 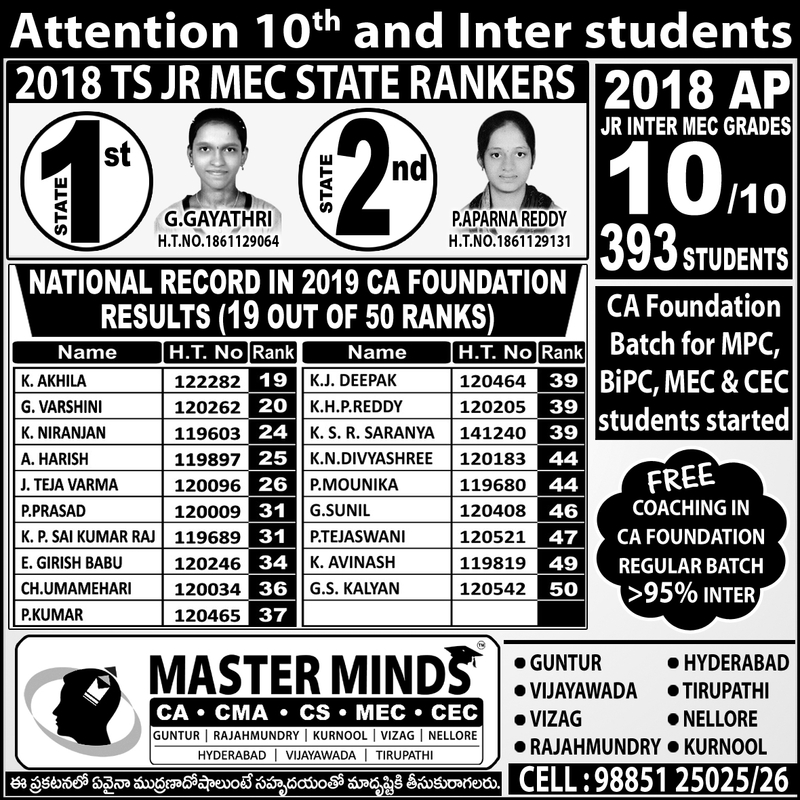 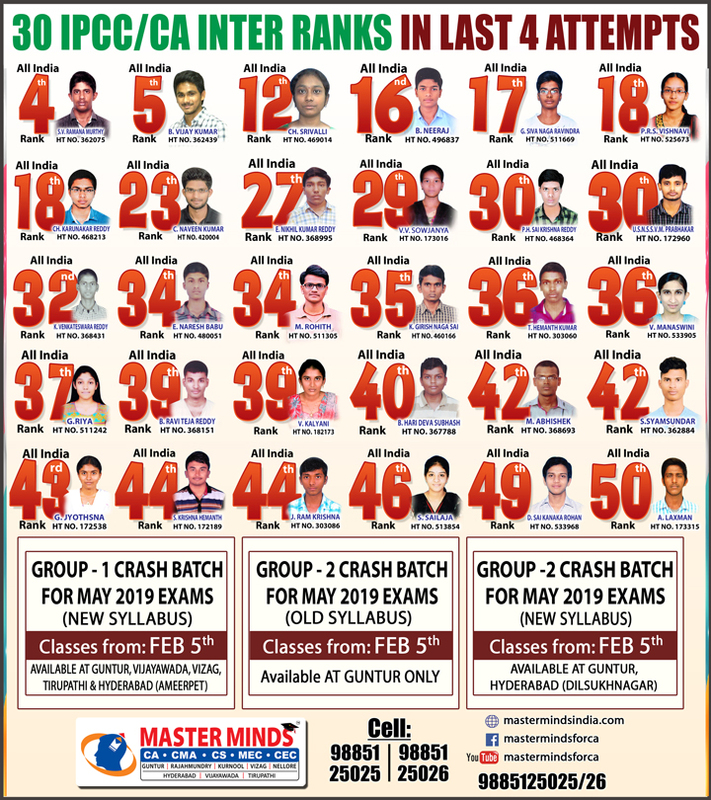 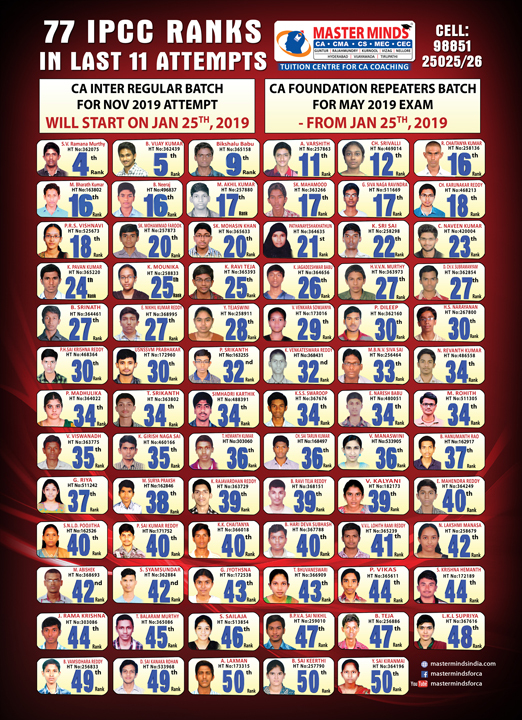 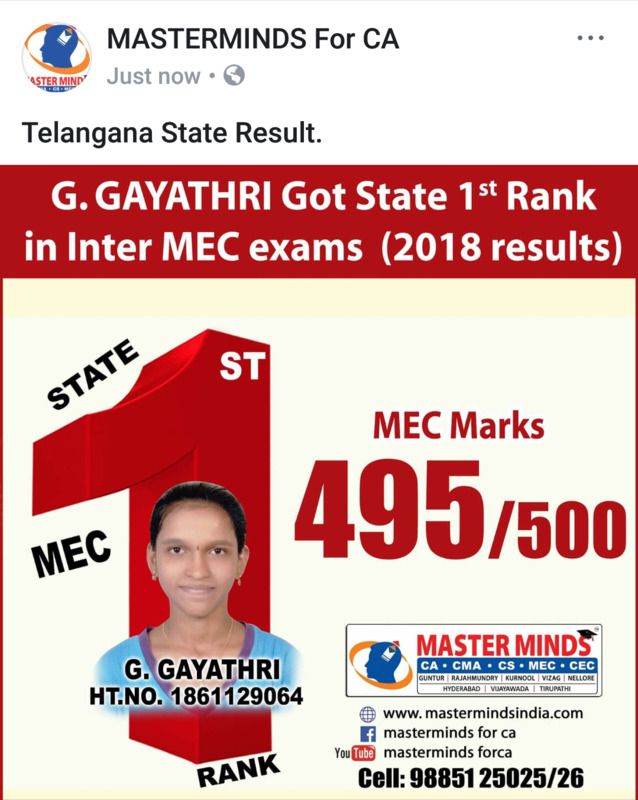 Masterminds 2009 MEC Completed 165 students got National Merit Scholarship of Rs.70,000/- (0ver 5 years a record in the history of Inermediate in Commerce). 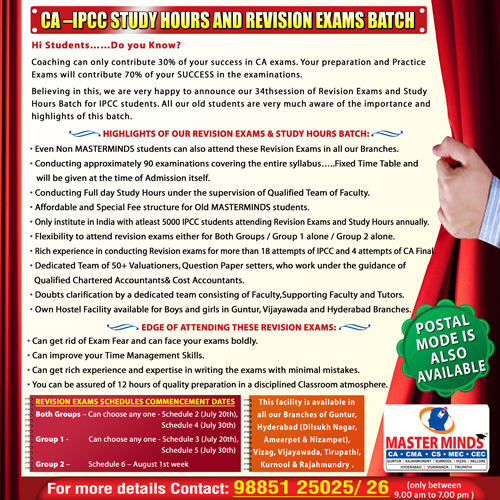 CA Final Registration Fee for students comming through IPCC IS Rs.10,000 /-. 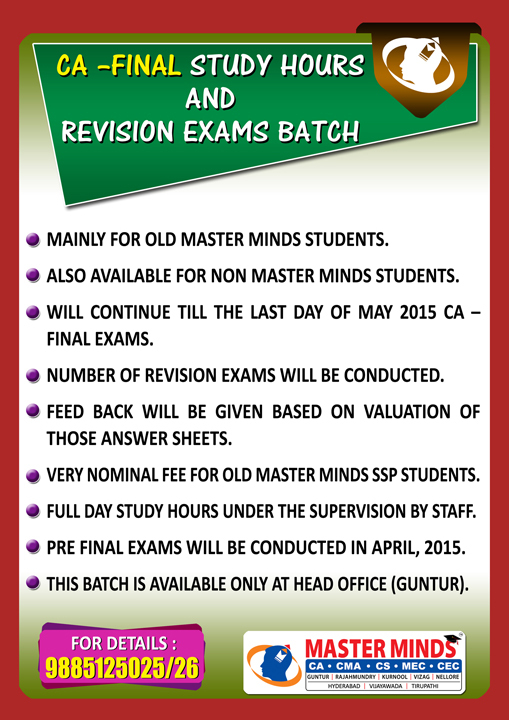 PE II students are allowed to appear for examinations upto may 2010. 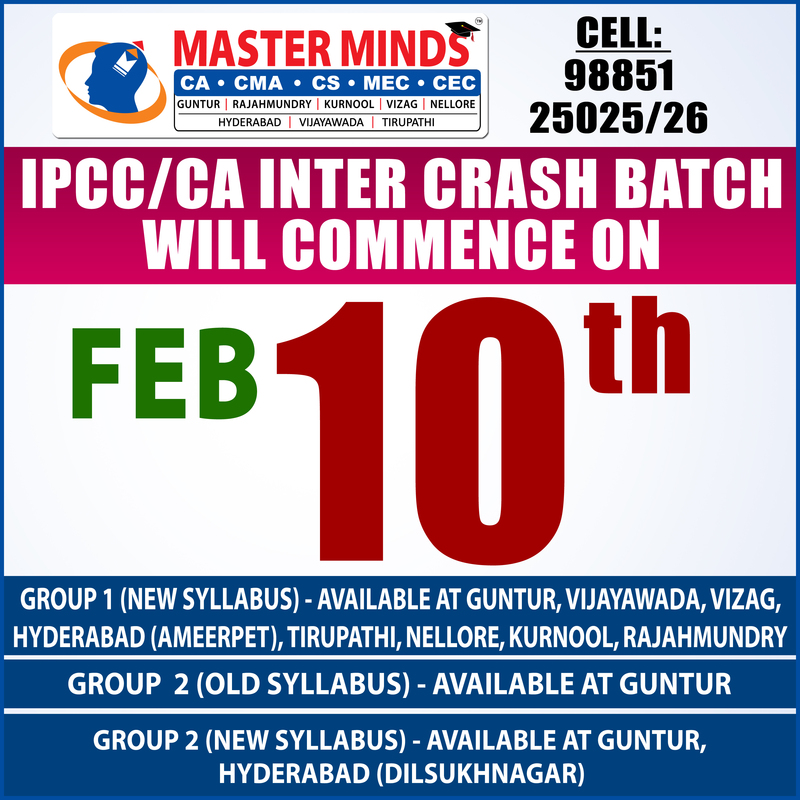 Mr.Murali, a highly qualified and 24 years experienced faculty from chennai is taking classes for IPCC. 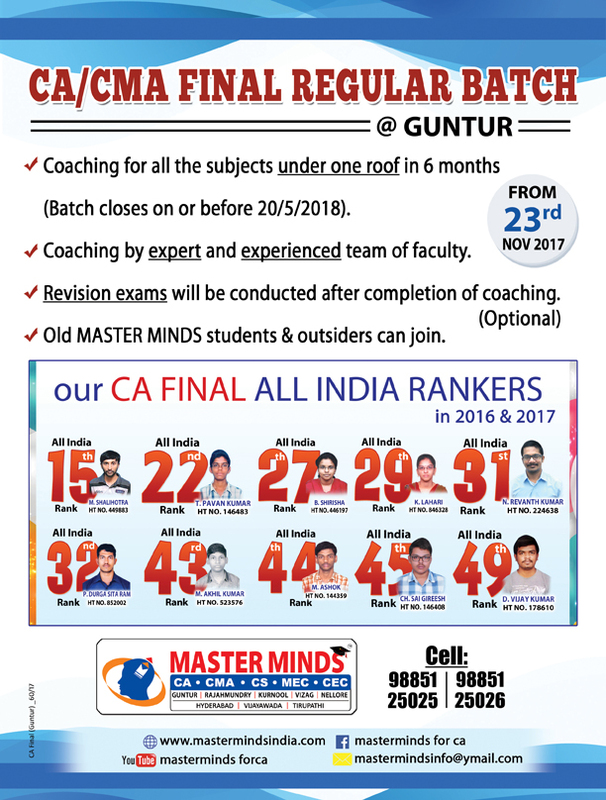 He teaches final classes also. 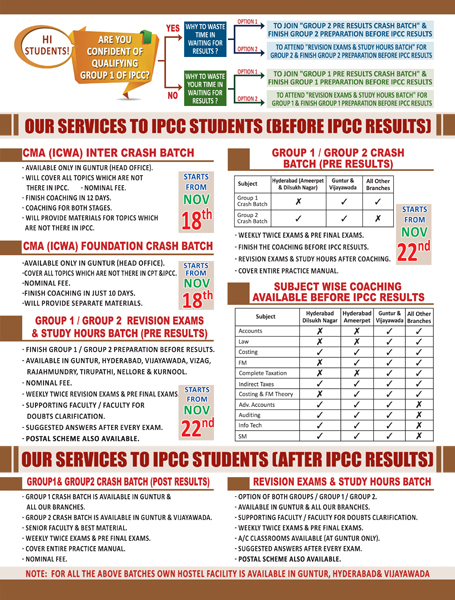 On August 6th, June 2009 ICWA Foundation results declared. 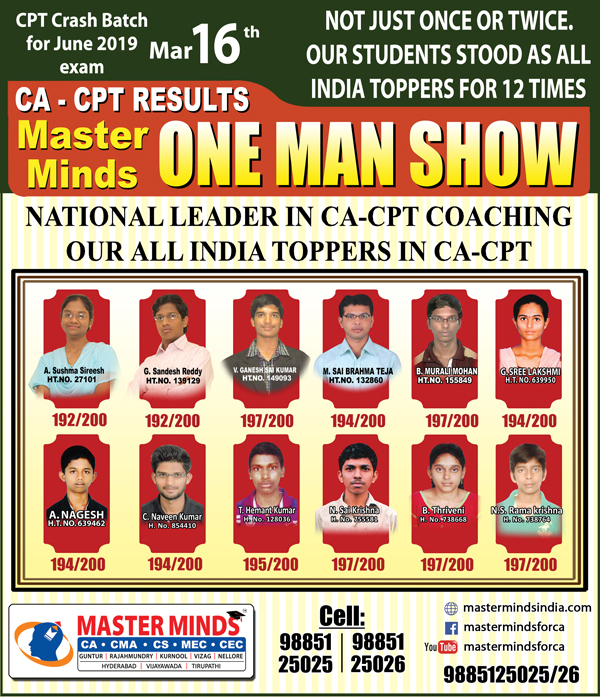 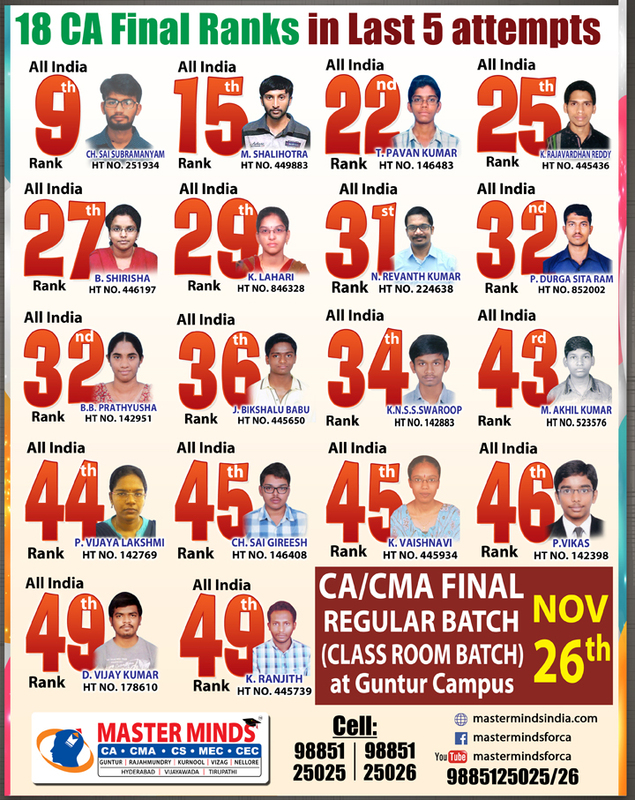 Our students Hari and Srikanth got All India 1st Rank. Till now we got 1st Rank in CA/ICWA for 6 times.